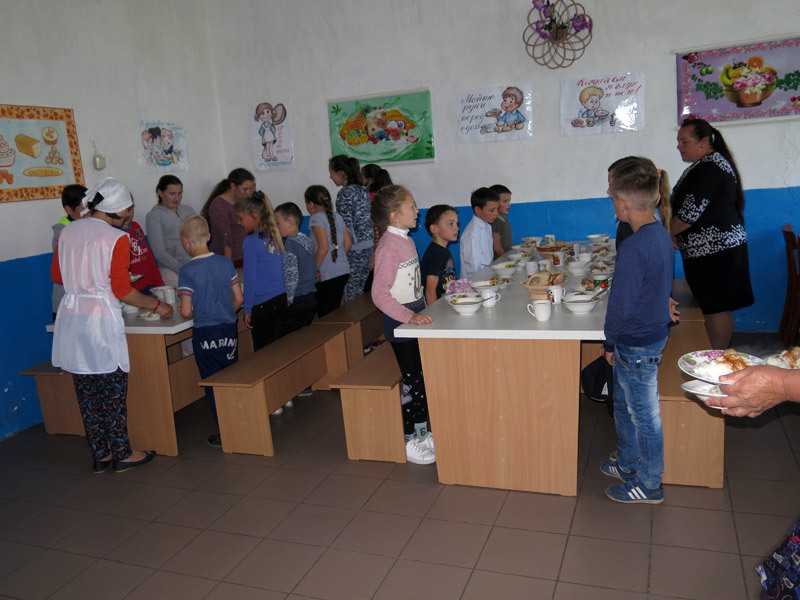 The bad and unhygienic conditions in the kitchen and dining room of Gymnasium in Copaceni, district Singerei were a big problem. This urgently needed a solution. Regional health care organizations warned the school administration several times. The healthy lunch that the children receive at school is very important for the body and the development of the children. They get what they need for their development there. 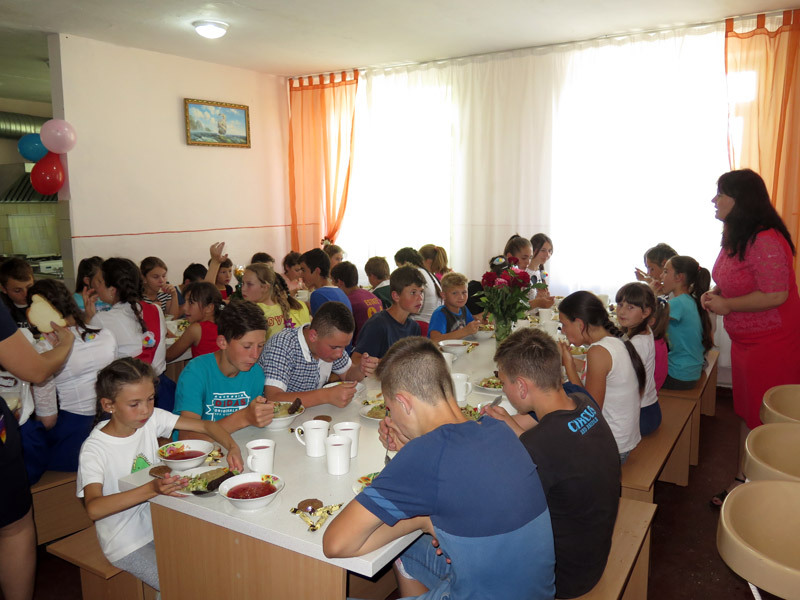 There are 110 school children in total, including 50 needy children, who visit our TKH BUNVOLENTIA after school. Especially important is this lunch for these needy children. Often, this is the only healthy meal they receive. That's why it is important to have kitchen and dining room well equipped. 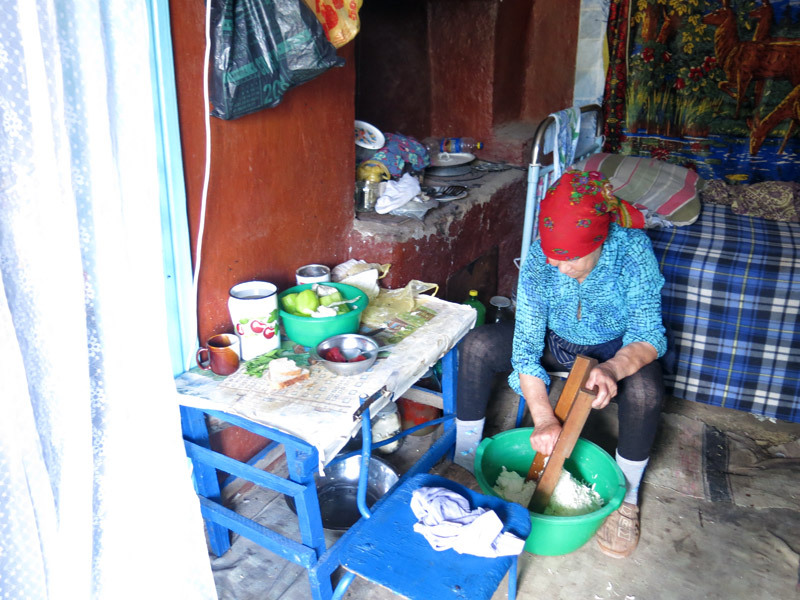 With the help of pastor Hans Bock (through Catholic parish Schierling / Germany), we could buy the necessary equipment and set up the kitchen wing and dining room. The children are now eating in a clean room. The food is stored and cooked in suitable rooms. Easter is a new life, a source of life. 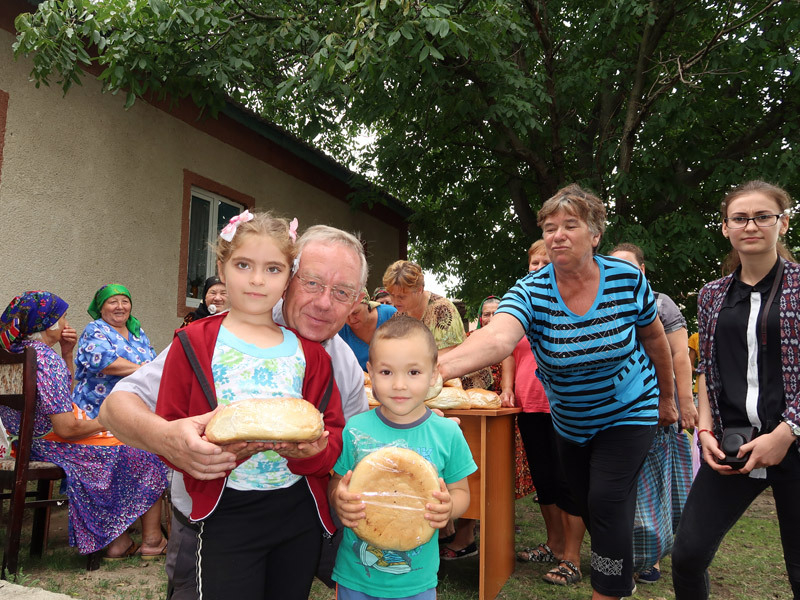 The needy, old, lonely and sick people of Grigorauca and Gangura, could feel the love and wonder of this holy feast. 250 families received food packages. 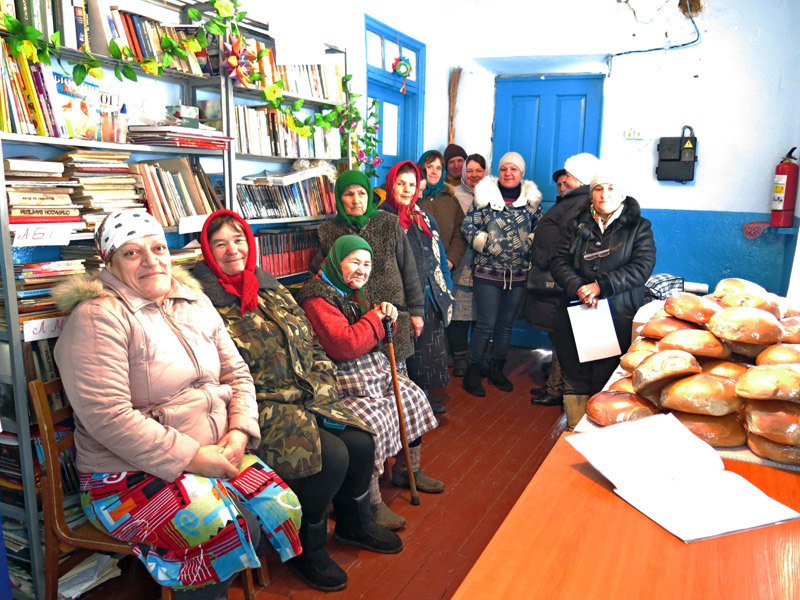 In total, about 3 tons of staple foods and sweets were distributed. 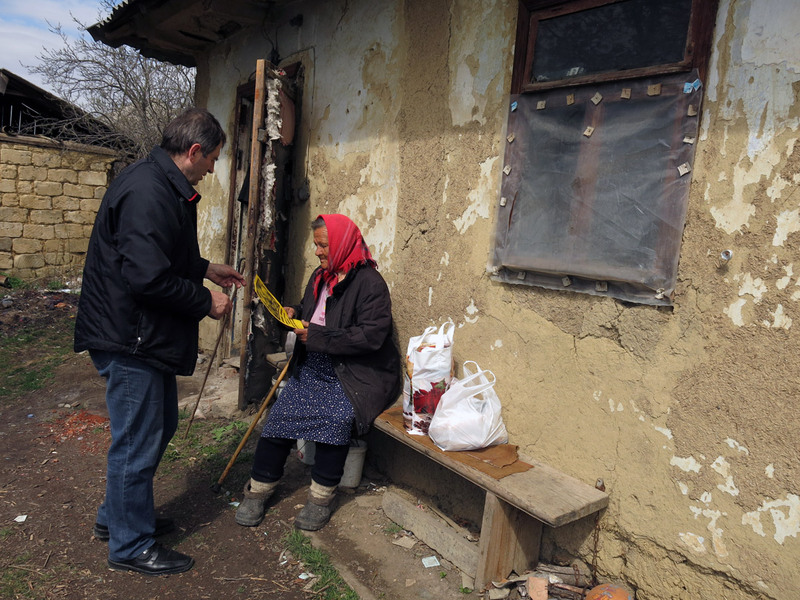 The needy people will celebrate a true Easter. 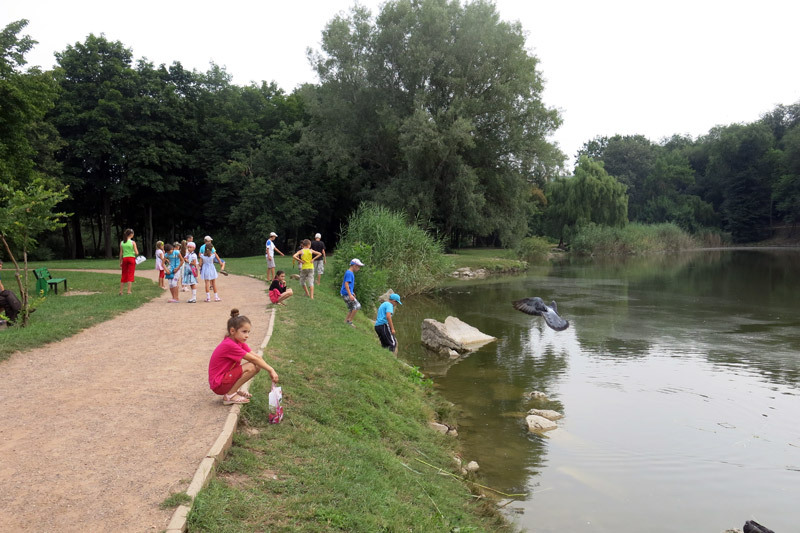 This beautiful action was financed by Hilfe für Osteuropa e.V., Todtnau (Germany) and PRO MOLDAVIA e. V, Gladbeck (Germany). 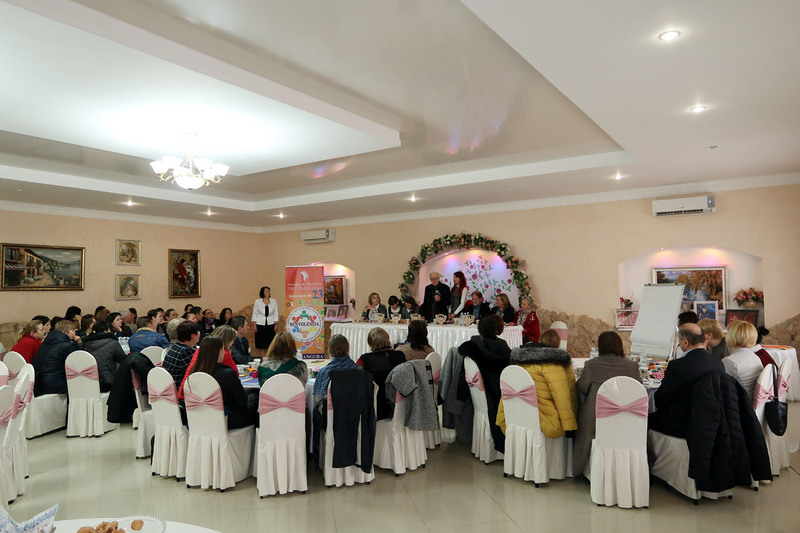 On March 16, 2019 there was organized the 23rd seminar for coordinators and teachers of all 16 day care centers for children BUNVOLENTIA and day care center “St. Maria” in the village Gangura, region Ialoveni. It was a wonderful meeting where 52 people took part. 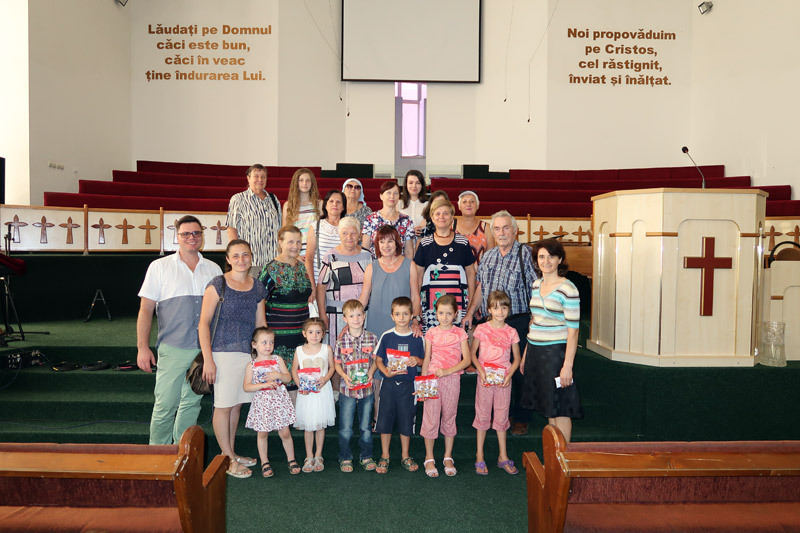 The dear guests of the seminar were the families Garst and Hollenstein from Switzerland. Mr. Garst was welcomed as an honorable citizen of Gangura. The seminar consisted of two parts. The first part was led by Mrs. Natalia Rotaru, psychologist. She presented a very important topic “The causes of bad children’s behavior”. The participants were offered to take part in different activities to show obviously the causes of bad children’s behavior. 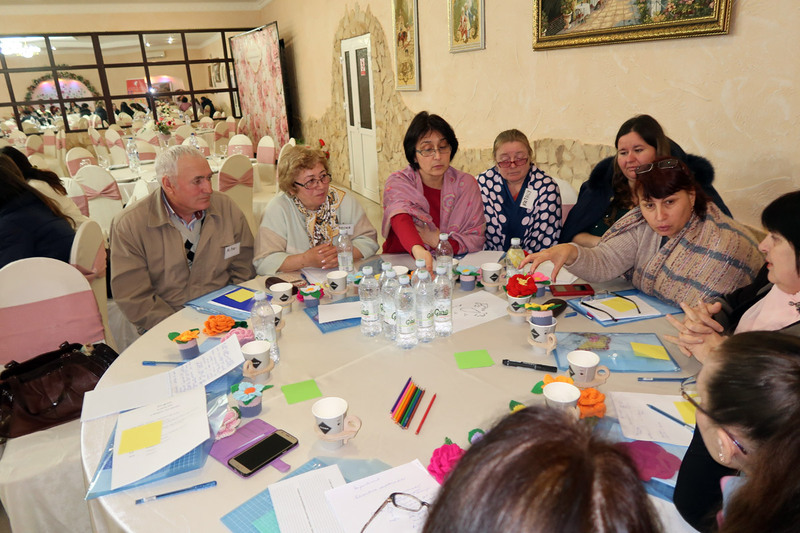 In the second part of the seminar the teachers and coordinators could discuss their problems and wishes. At the same there was organized a seminar for the accountants. 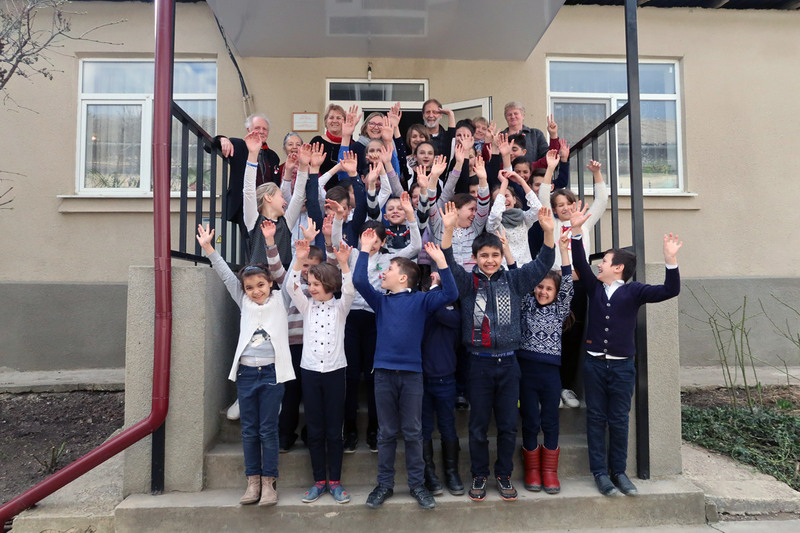 The president of the organization „Help for Children in Need” (HCN) Mr. Peter Garst and vice-president Mr. Edwin Hollenstein visited Moldova in March. They were accompanied by their wives Mrs. Martha Garst and Mrs. Beatrice Hollenstein. It was the 33rd Mr. Garst’s visit. 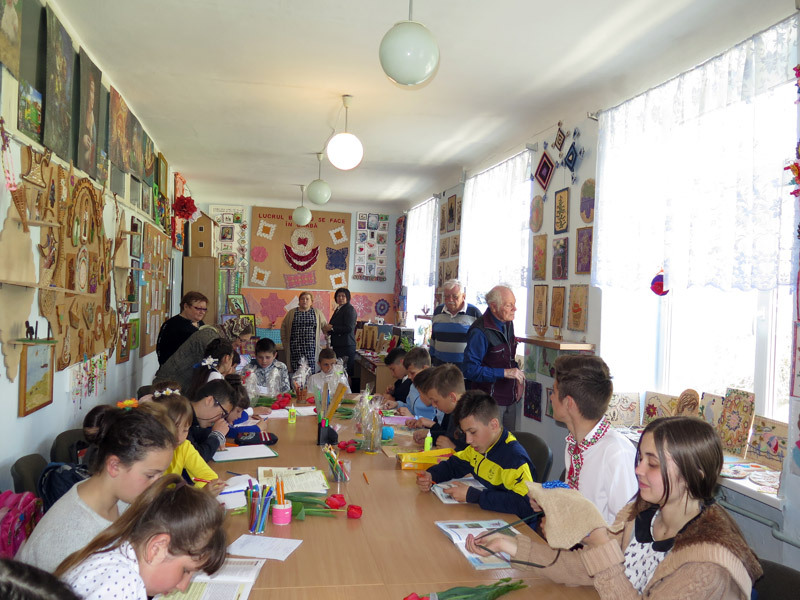 Our Swiss partners visited their projects: 16 day care centers for children BUNVOLENTIA, day care center for the elderly “St. 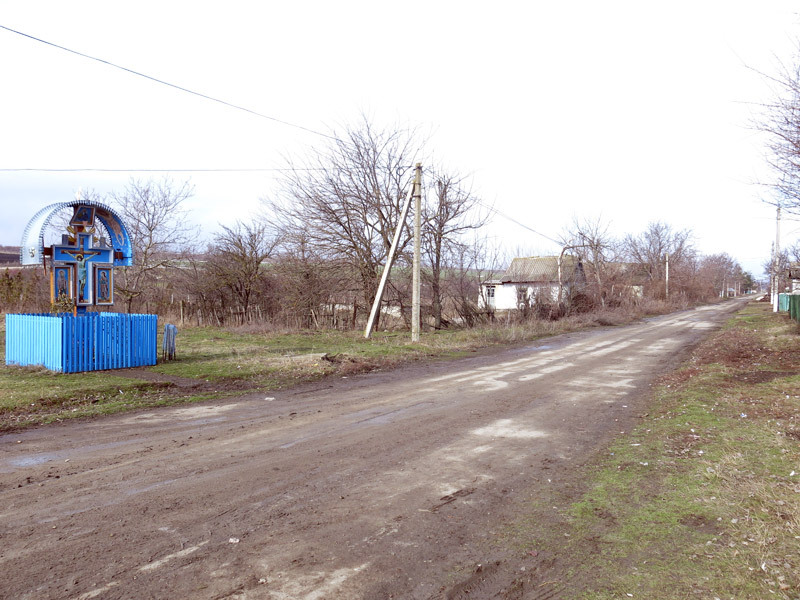 Petru” and also another projects such as day care center for children “St. Maria” in Grigorauca. 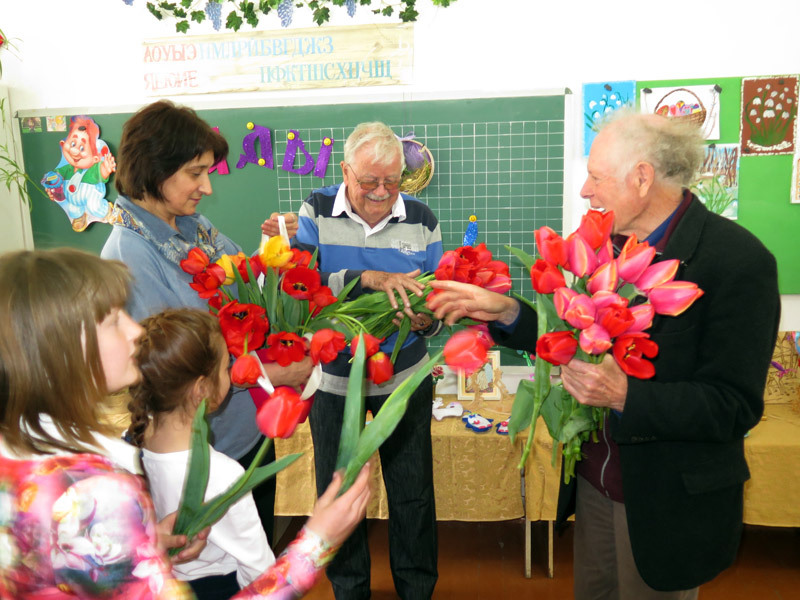 Everywhere they were met with flowers and hand-made gifts. The families Garst and Hollenstein could spend much time with children and enjoy a tasty lunch with them. They could make sure pupils have a good meal and they are well cared for. 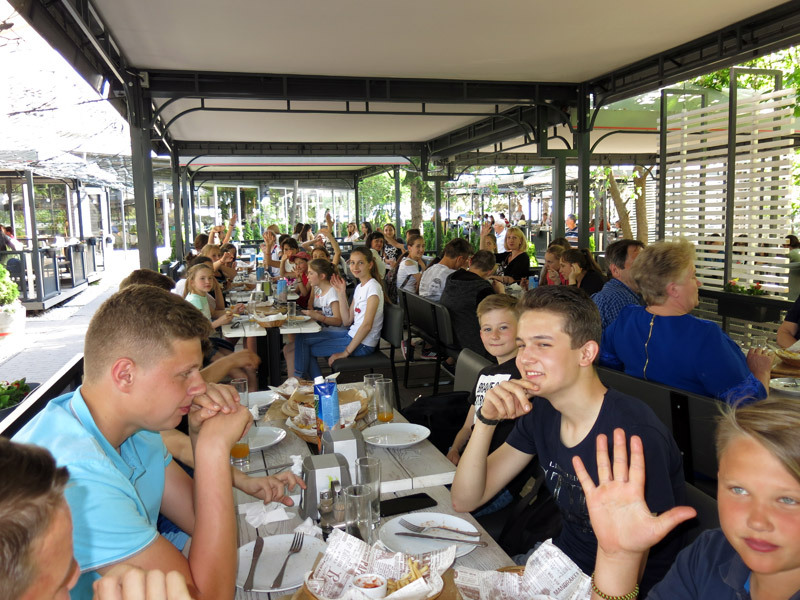 A great feast in Grigorauca! 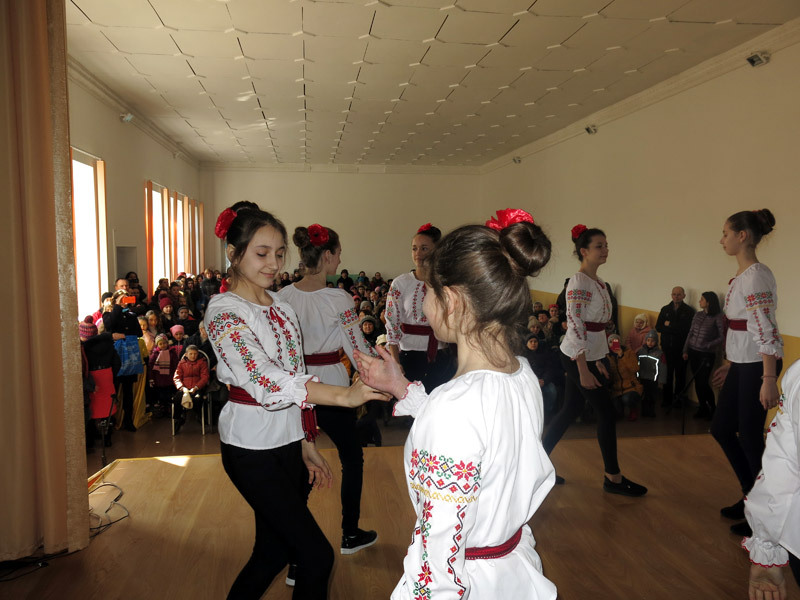 A beautiful feast took place in the village Grigorauca on March 5, 2019. The children from the day care center for children “St. 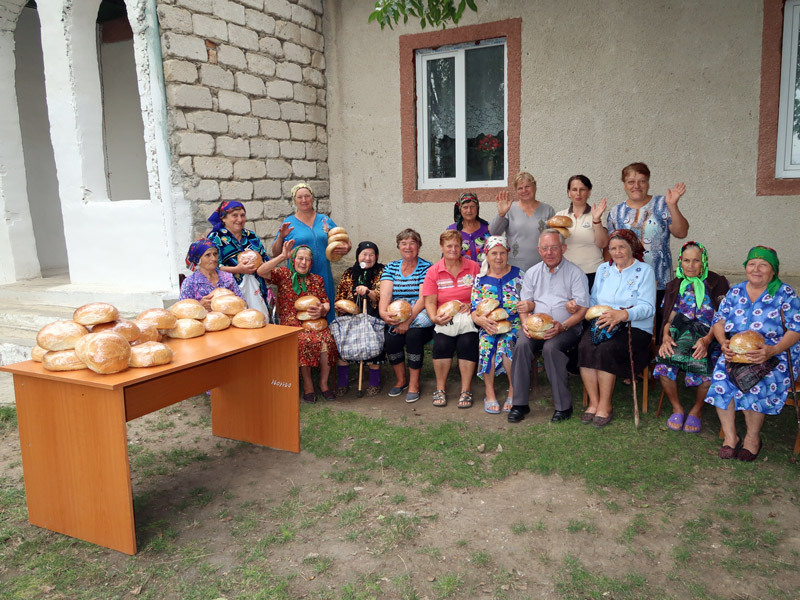 Maria” congratulated all women of the village with the Women’s Day. 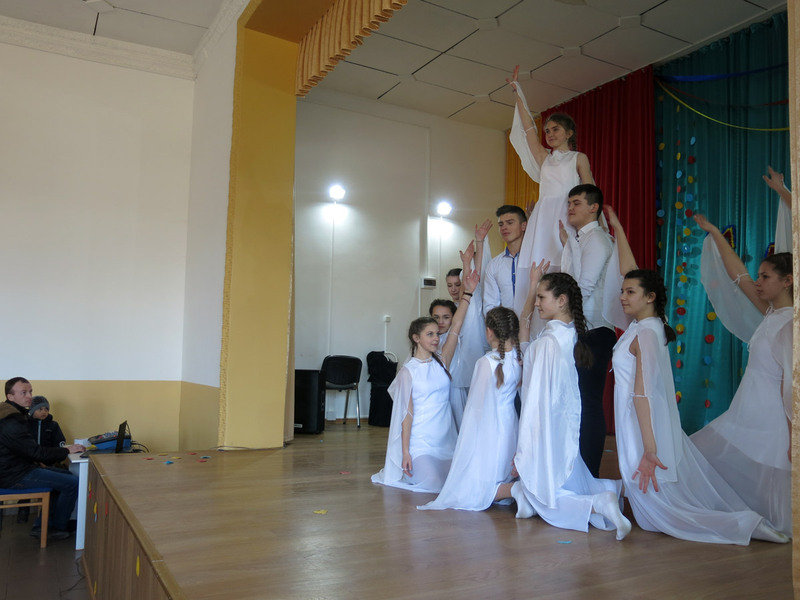 They prepared a great performance with dances, songs and puppet theatre. 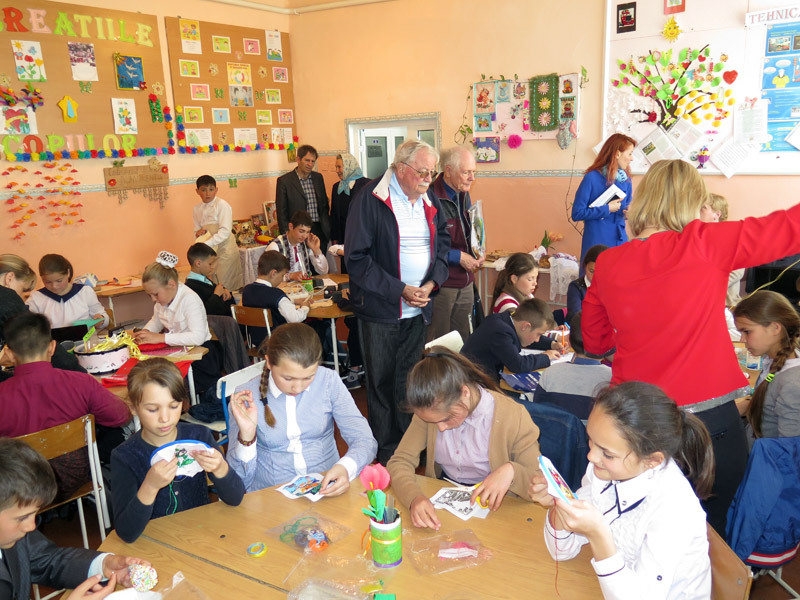 The children made with joy and love presents for their mothers, grandmothers, sisters and women from the village. Despite the coldness the hall was full. All present enjoyed this wonderful day! Structural requirements and technical equipment are not surely the most important feature of schools. However, they play a significant role in the good school functioning as well as in the creation of a good work atmosphere. 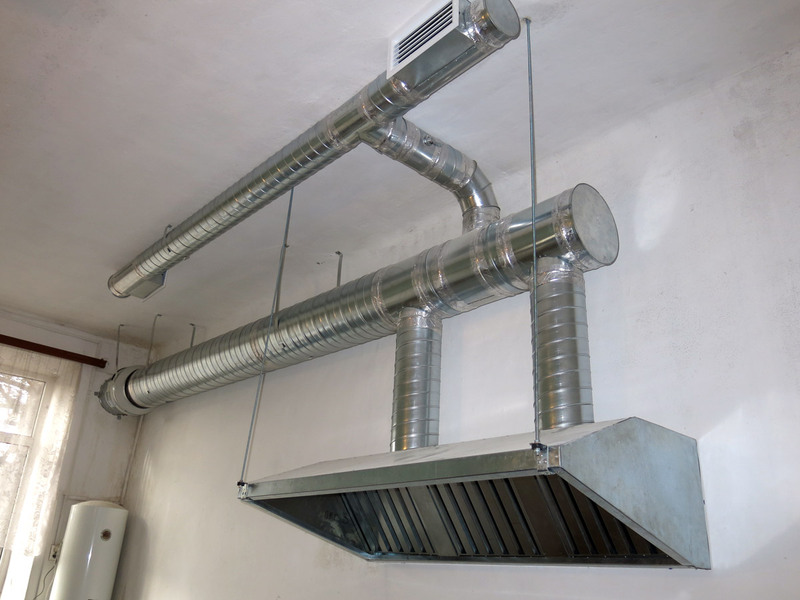 In this way, we have succeeded in installing new ventilation systems in three different kitchens, thereby significantly improving the working conditions of the staff. This will undoubtedly have a positive effect on nutrition and then probably on pupils - improving the atmosphere from all points of view. 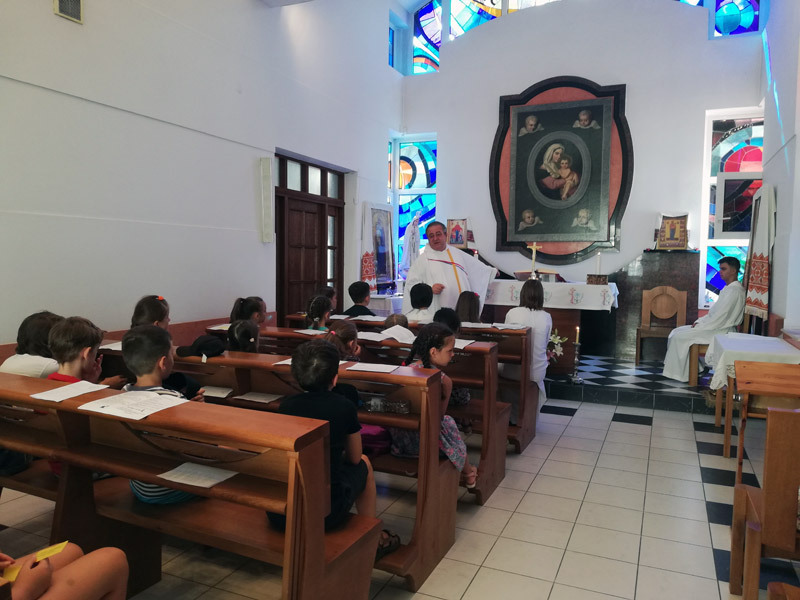 The project was successfully implemented with the support of the Local Council and the financial support of the municipality of Baar / Switzerland (through Father Erwin Benz) as well as our professional and organizational support. 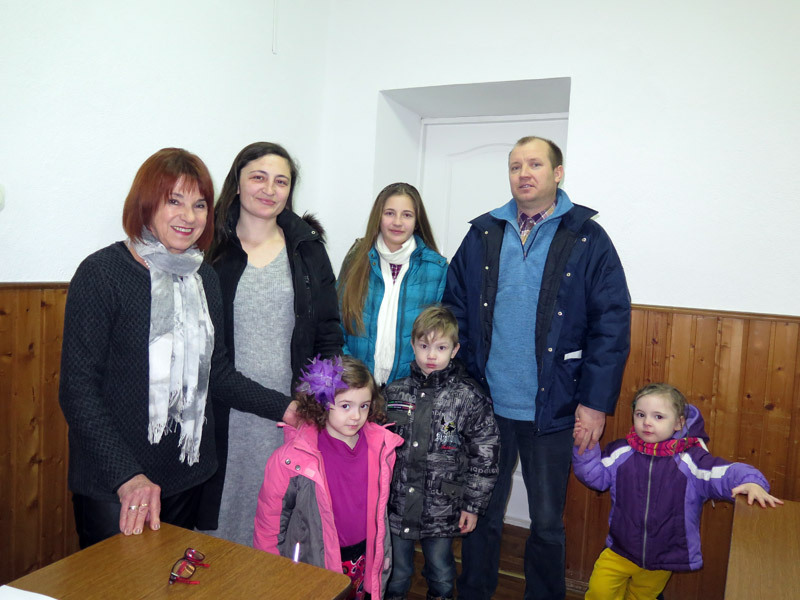 A new year comes with new blessing and with first visitors from Todtnau. 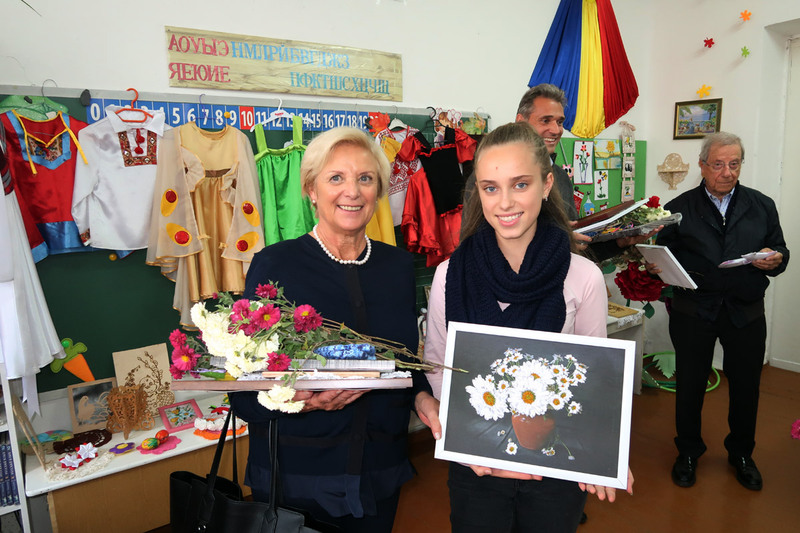 Mrs. Ursula Honeck, President of “Hilfe für Osteuropa e.V.” has been working in Moldova for 24 years. In her first visit in this year, she was accompanied by her husband, Dr. Thomas Honeck. 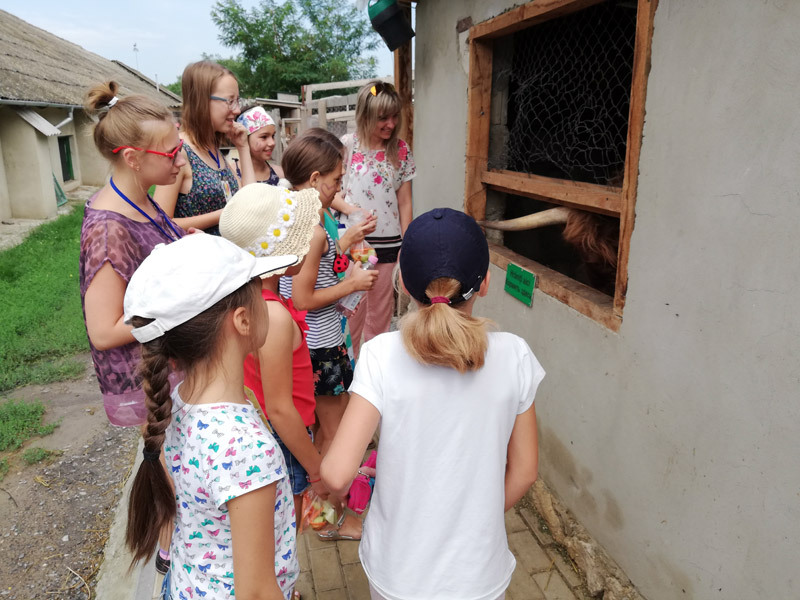 They visited the projects of the organization from Orhei and Edinet. 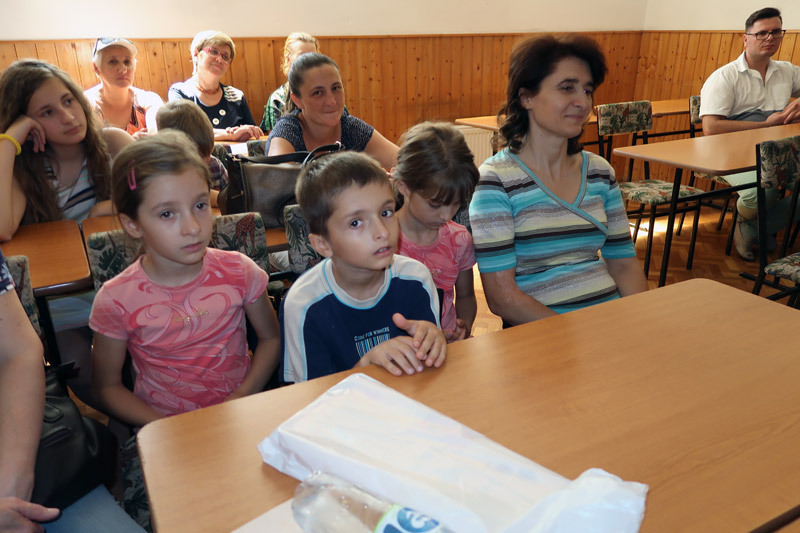 In Chisinau took place a cordial meeting with all sponsored families. The sponsored families were glad to see Mrs. and Mr. Honeck. Many words of thanks and blessings were told. With great joy, we would like to announce that our annual Report of Activity 2018 is now available on our website under the Reports section. 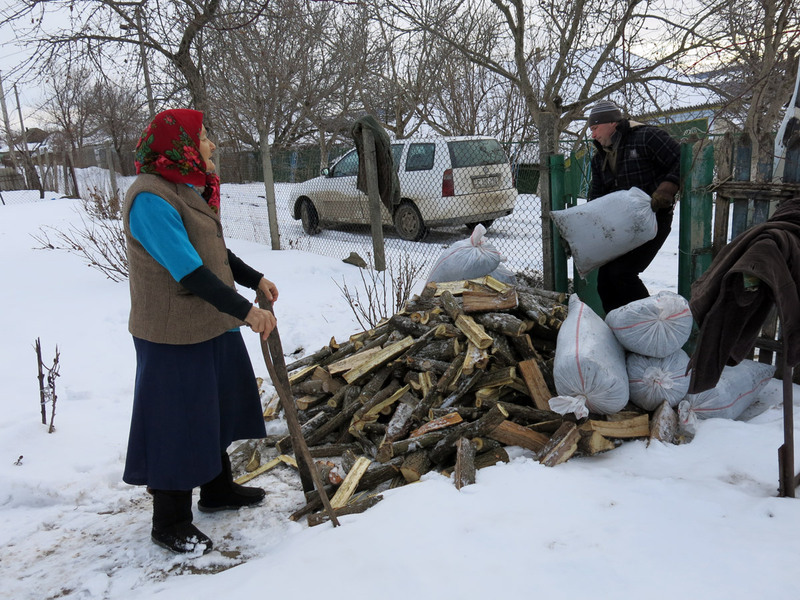 The current socio-economic situation in Moldova is quite difficult. That's why there are more and more people who need help; the majority are the elderly, disabled and large families. 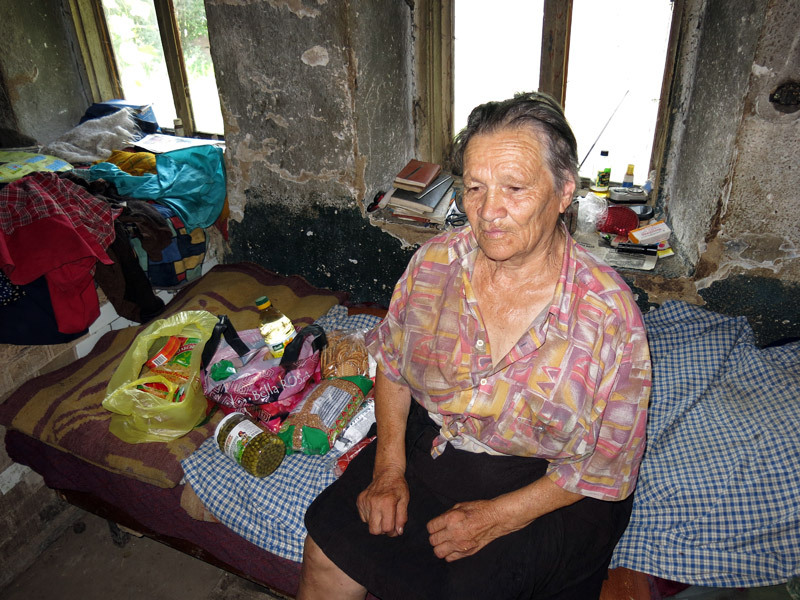 Each year the lives of these needy people are getting more difficult. 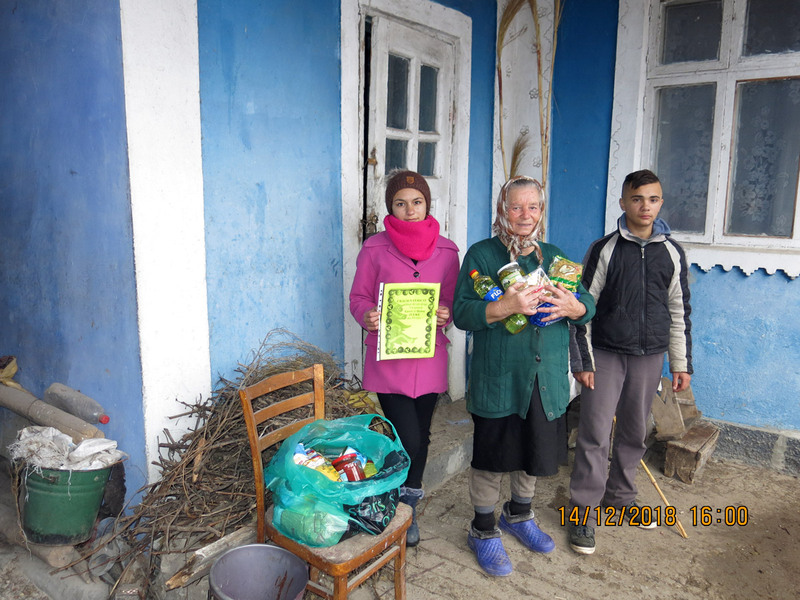 Thanks to our merciful friends from Austria 30 needy families from villages Grigorauca and Copaceni got food packages. This is more than just a sign of compassion, love and care, which gives the elderly, the disabled, and the large families much joy. Their hearts were full of joy and gratitude. 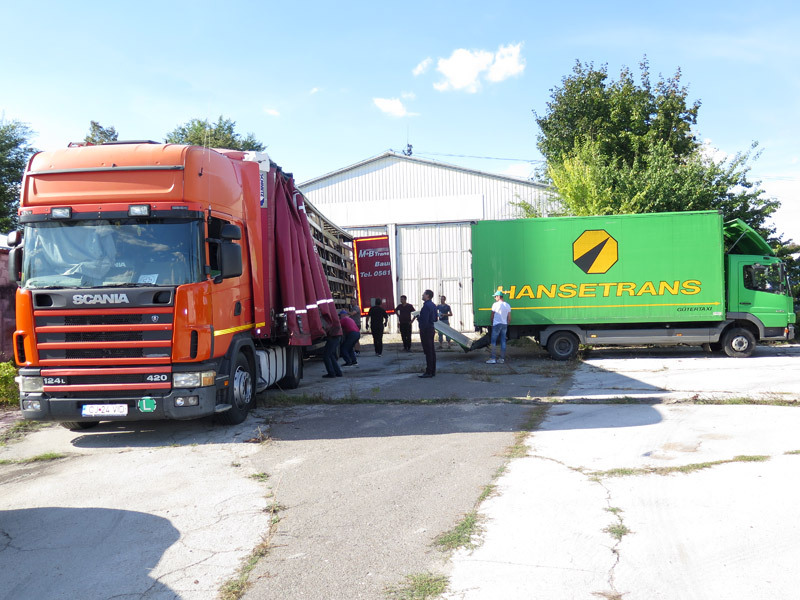 This action was financed by Franziskusgemeinschaft, Pinkafeld, Austria. Christian mercy is an appeal. This is our mission, entrusted to us by the Church of Christ. It is also our duty to follow the commandments of love. In our difficult financial time, the social-vulnerable strata of the population (people with disabilities and pensioners) are in a difficult situation. 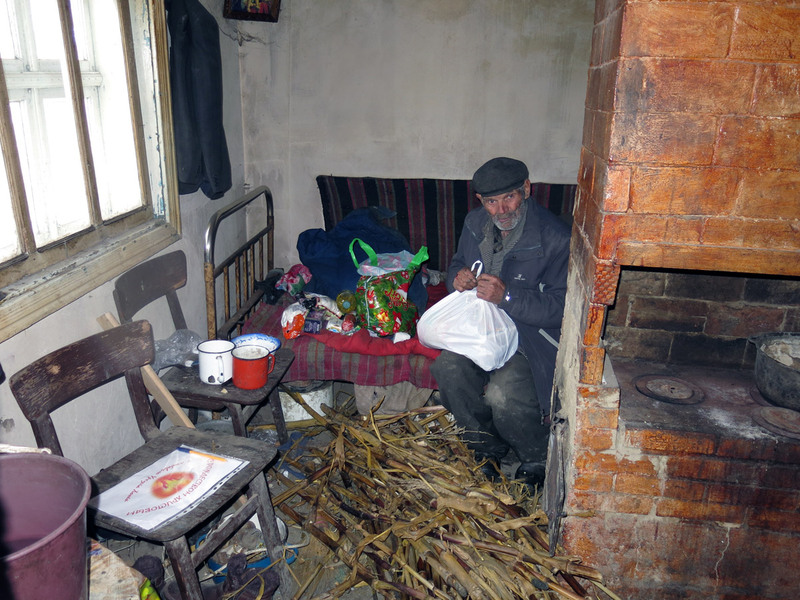 In the winter-heating season, these needy categories feel hunger and cold, suffer from severe chronic diseases. 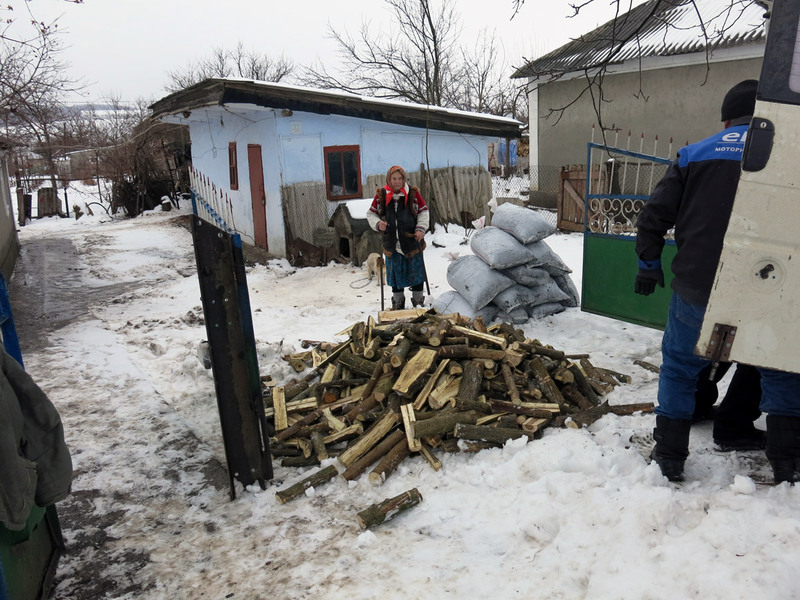 Thanks to the love of Christ and our partners from the organization HILFSWERK LIECHTENSTEIN, we were able to provide the needy from the 10 poorest families of Grigorauca with firewood and coal in this difficult period. 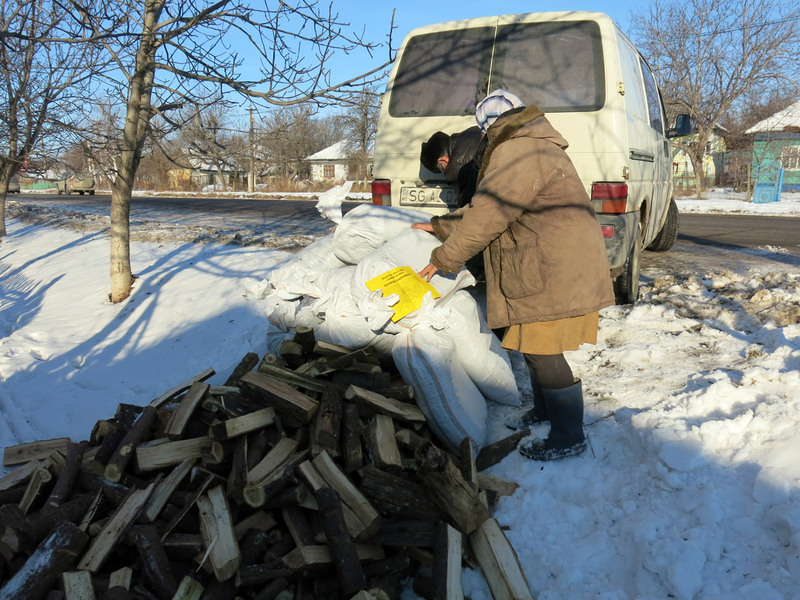 For people in need, this is a great help that will assure them survival in the winter period. We thank non-indifferent people who present their hearts full of love and mercy. 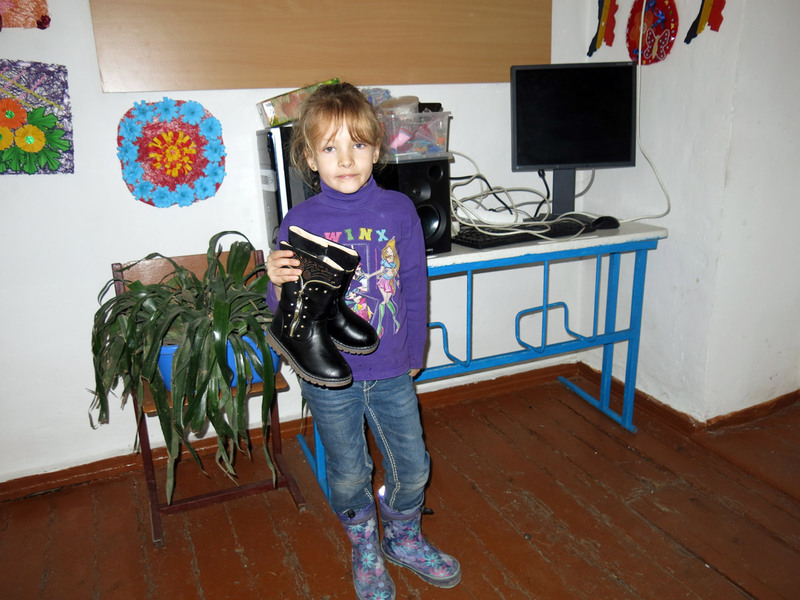 202 children from our day care centers BUNVOLENTIA and day care center for children "Hl. Maria " had a great joy. They have got winter shoes. These children have financial difficulties. Often their parents do not afford to provide them with the necessary. Due to this gift, the little ones are protected from the cold. The parents are very grateful, and the boys and girls are very happy. 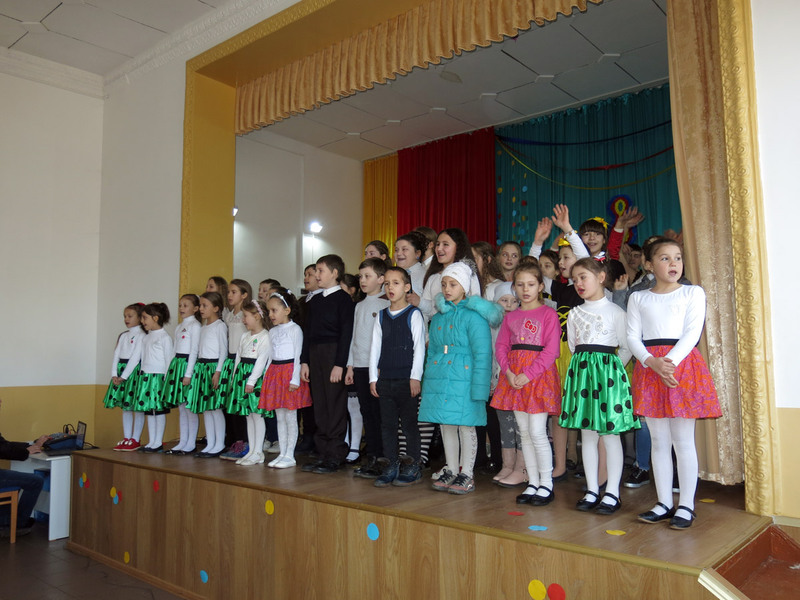 The campaign was financially supported by Trilingual Dayschool DEF GmbH, Switzerland. Christmas Eve is a period of surprises, miracles and gifts. 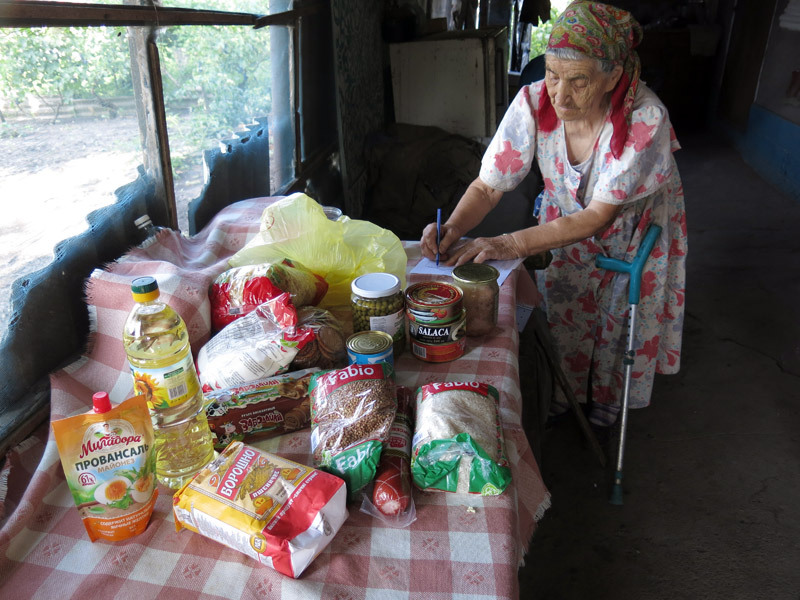 It turned out to be the same for needy old people from the villages Gangura and Grigorauca, who could feel the spirit of the approaching feast by themselves. 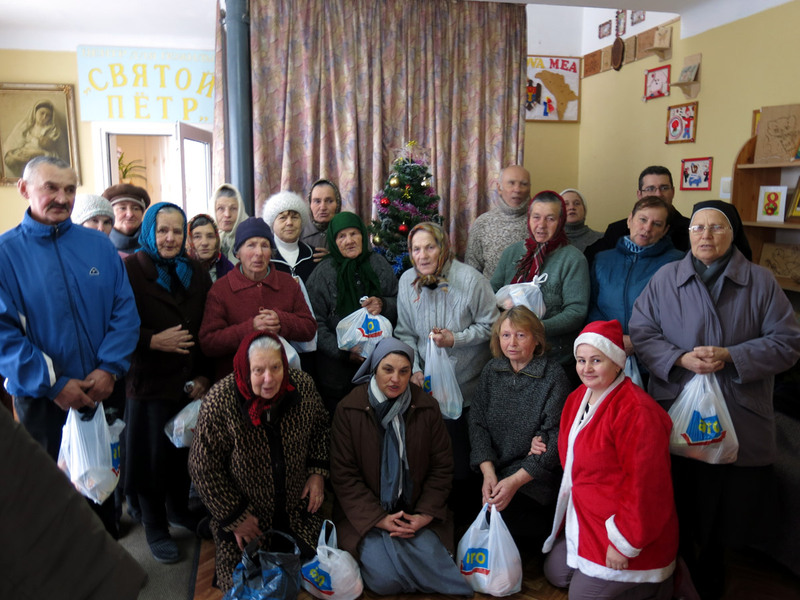 200 poor and sick old people received food packages to celebrate Christmas beautifully. 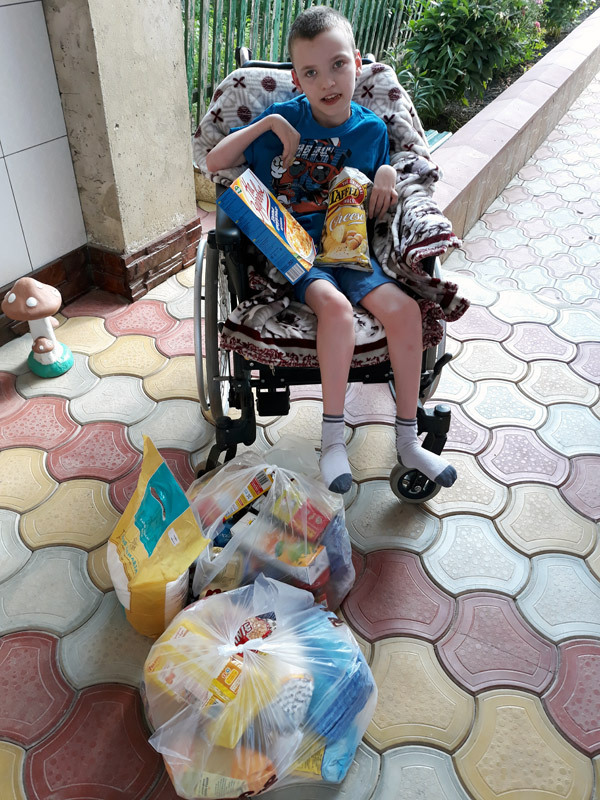 They accepted these gifts with deep acknowledgement and were very grateful to Family Zühlke (Switzerland) and Mrs. Ursula Honeck (Germany), whose financial support made this action possible. 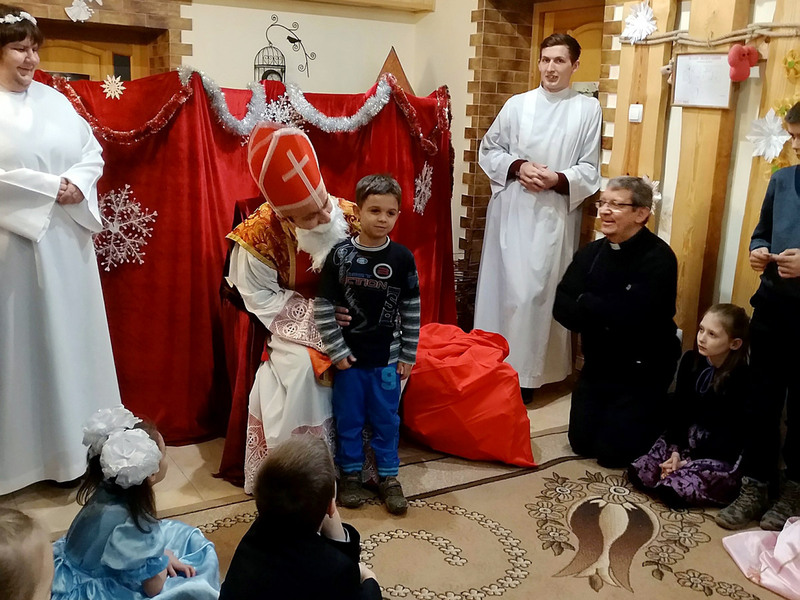 The needy children from our projects for kids in Moldova, as well as from Transnistria, waited and hoped that Saint Nicholas would not forget them. And, of course, he did not forget them. 1240 boys and girls had received sweet gifts yet. The Christmas action was supported by Hilfswerk Liechtenstein, President Mrs. Bettina Pelger-Sprenger, Triesen. We are in the contemplative Advent season. 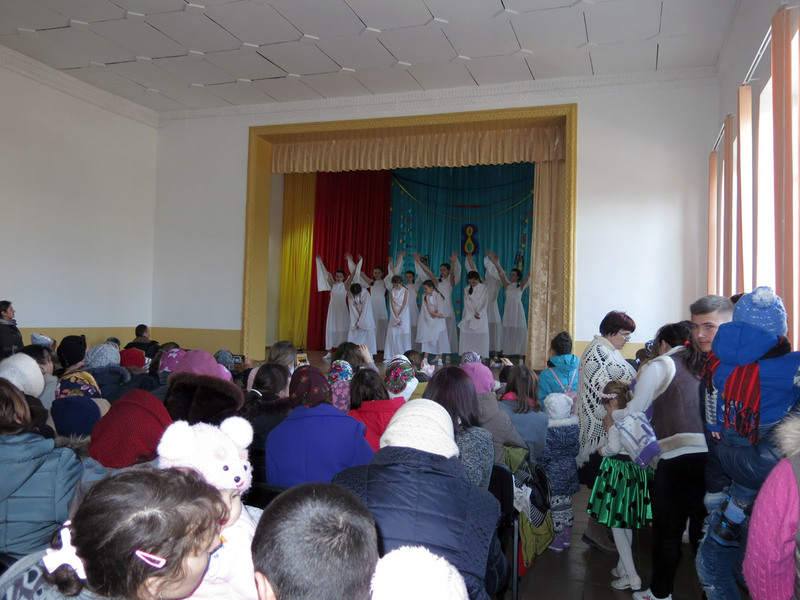 The people from Grigorauca are preparing for Christmas to celebrate the arrival of Christ the Redeemer. 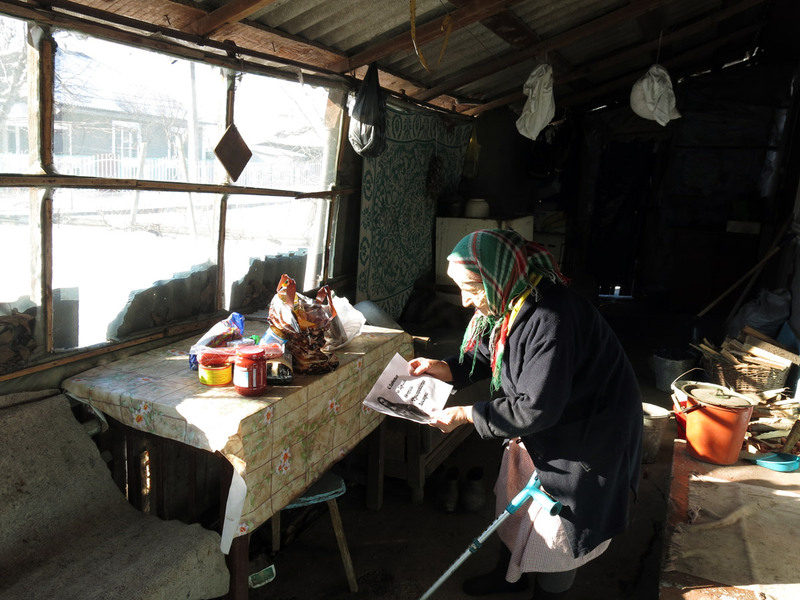 It also means that they go to church every day and in prayer they prepare for the feast of the Incarnation of God. Early in the morning they go to a special service - Rorate. They do it with faith, hope and love. Afterwards there is organized breakfast for them. The local pastor and the nuns participate actively too. 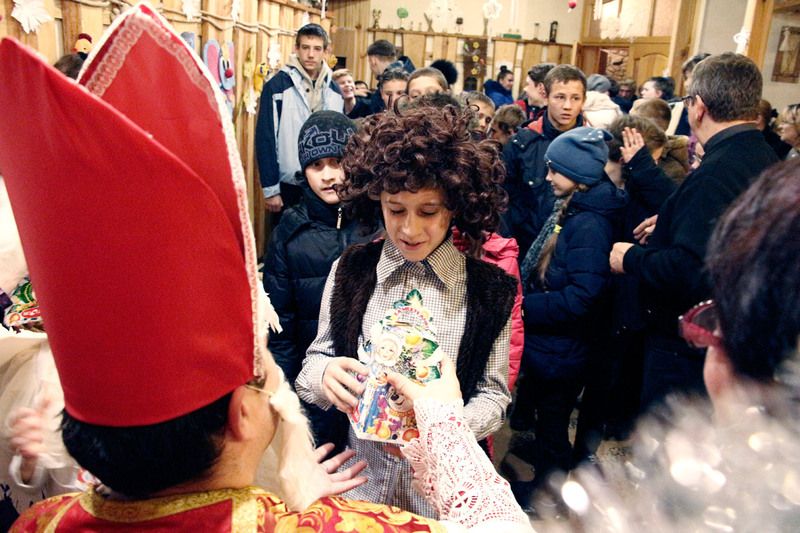 Today St. Nicholas didn’t forget about the old people; during the meeting he gave everyone a gift. The action was realized due to the assistance of Father Erwin Benz, Switzerland. 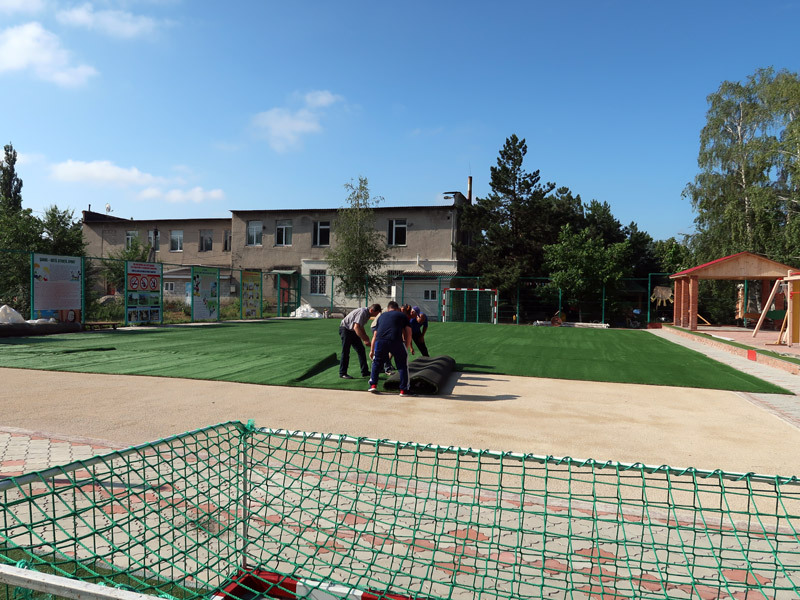 Through the mediation of Erwin Benz, Switzerland, it has become possible to install artificial grass in the training room as well as on the playground of the kindergarten. 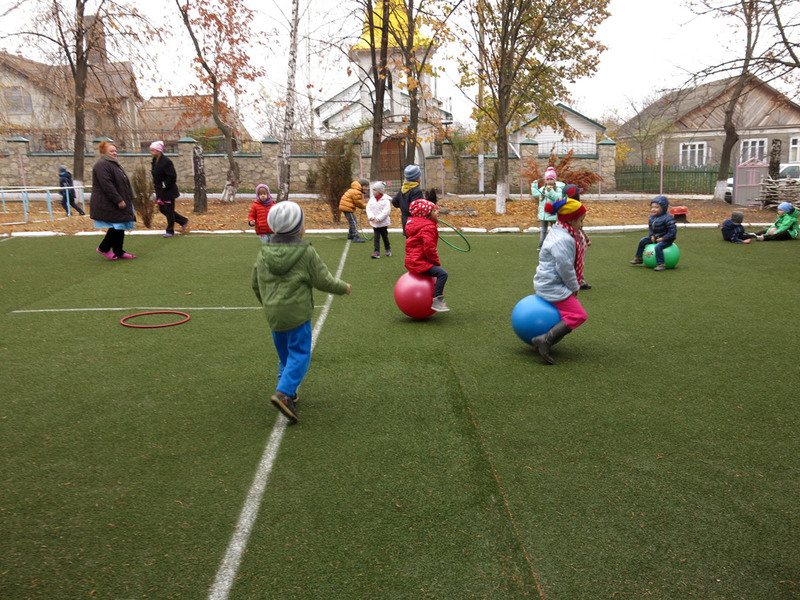 Children can play and practice sport at any time of the year. 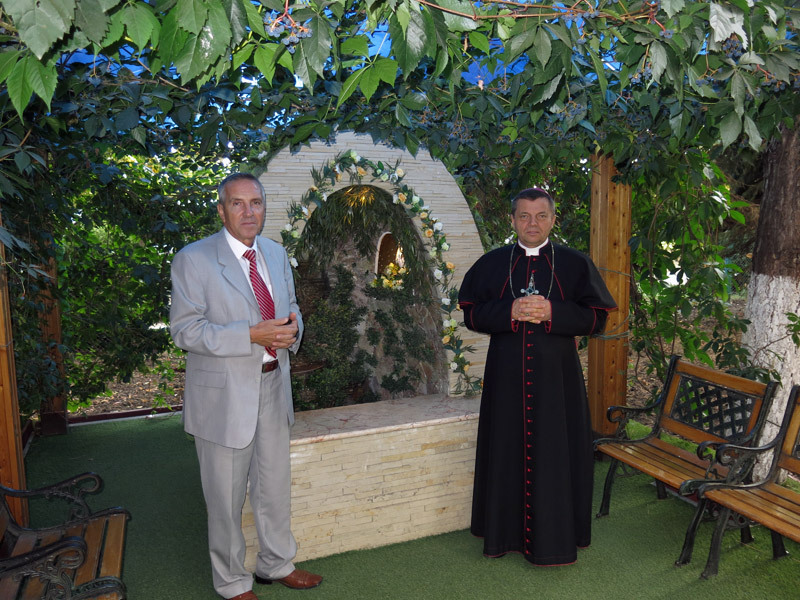 The staff of the kindergarten and the children’s parents thank Father Erwin a lot. 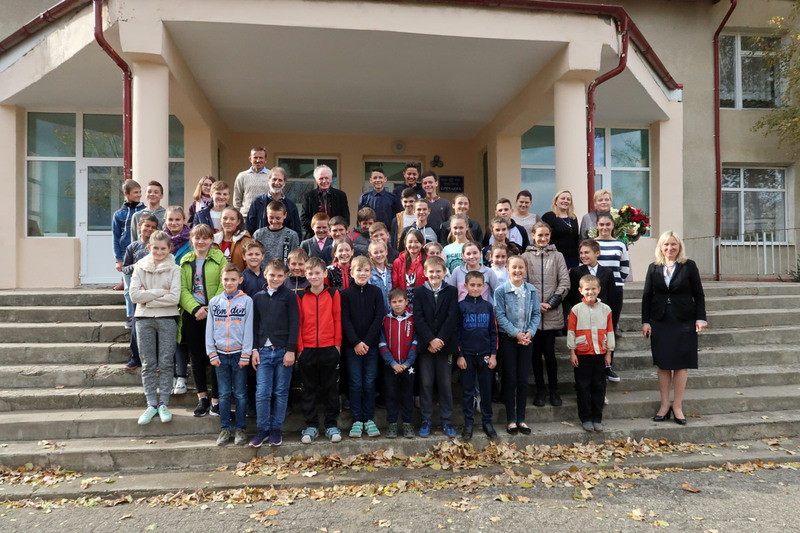 In the period from 30.10 till 01.11.2018 the president of the Rotary Club Zug-Kolin, Mr. Roland Imboden, together with Mrs. and Mr. Helen and Gerry Zühlke visited the village Misovka, to get acquainted with the day care center for children BUNVOLENCIA. 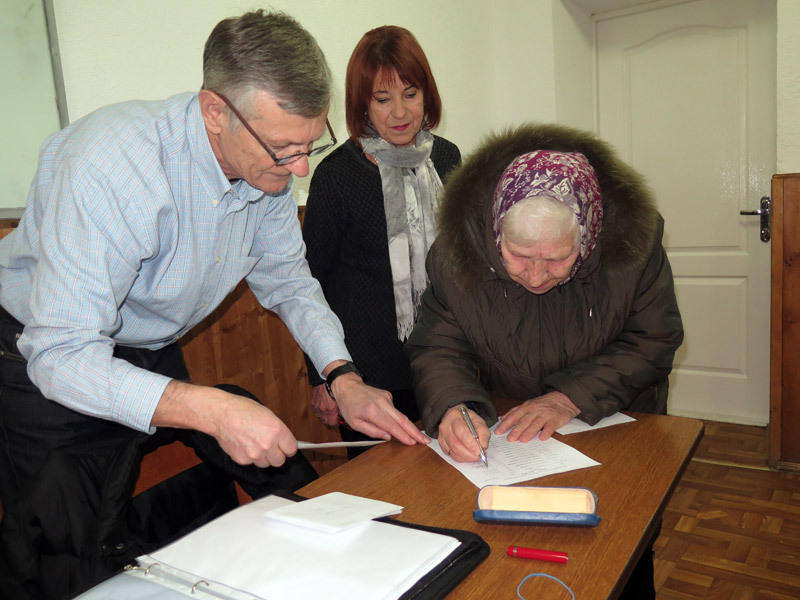 This project is funded by the Rotary Club Zug-Kolin. 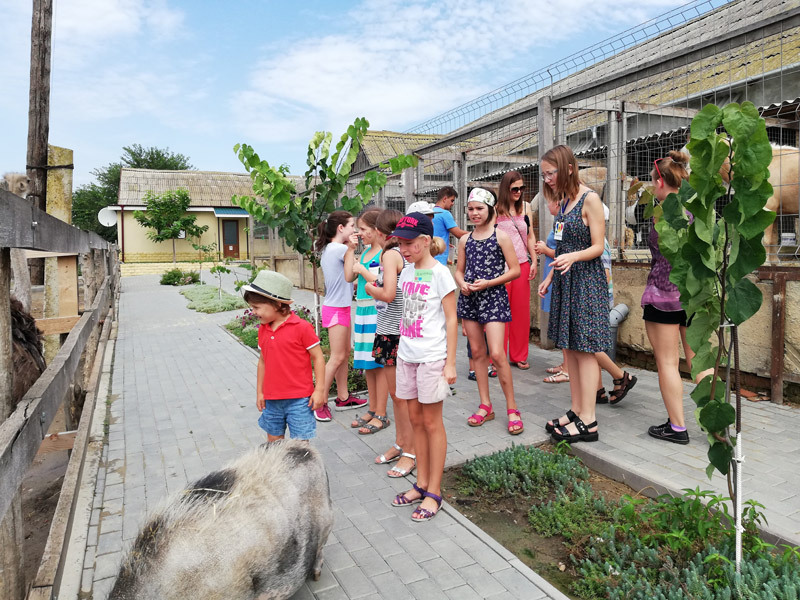 The guests had the opportunity to see the activities of this center and to communicate with the children and the teachers involved in the project. 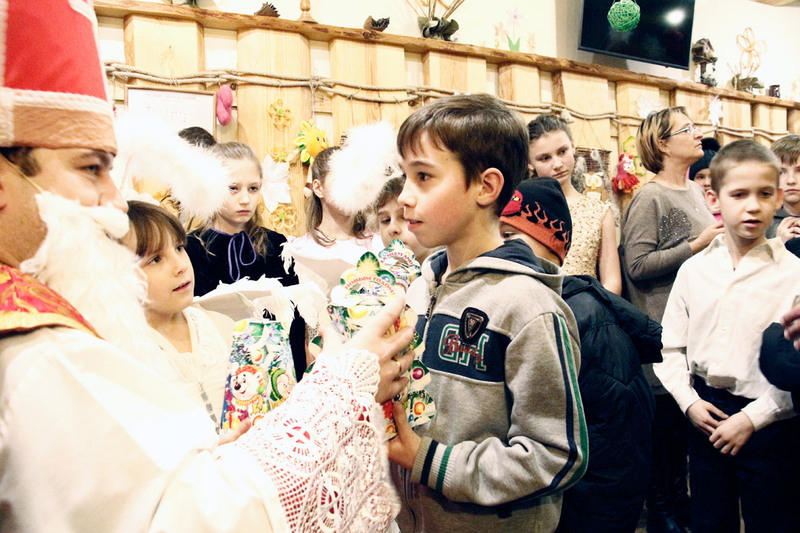 As a token of gratitude, the children gave gifts to the guests that they had made by themselves. 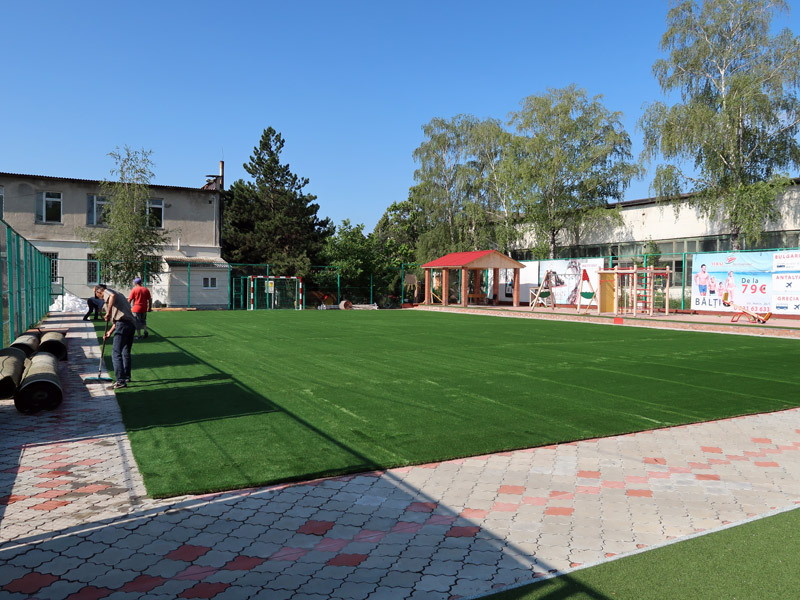 At the same time, guests also visited other projects that they co-financed, including providing the kindergarten with furniture and necessary equipment. Thankful children met the guests with songs, dances and games. 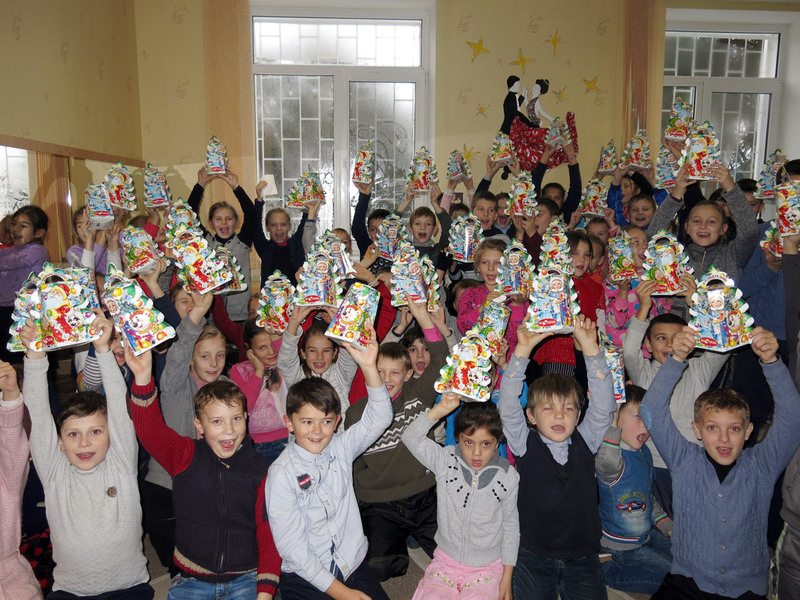 The gifts offered by the guests made the children happy. 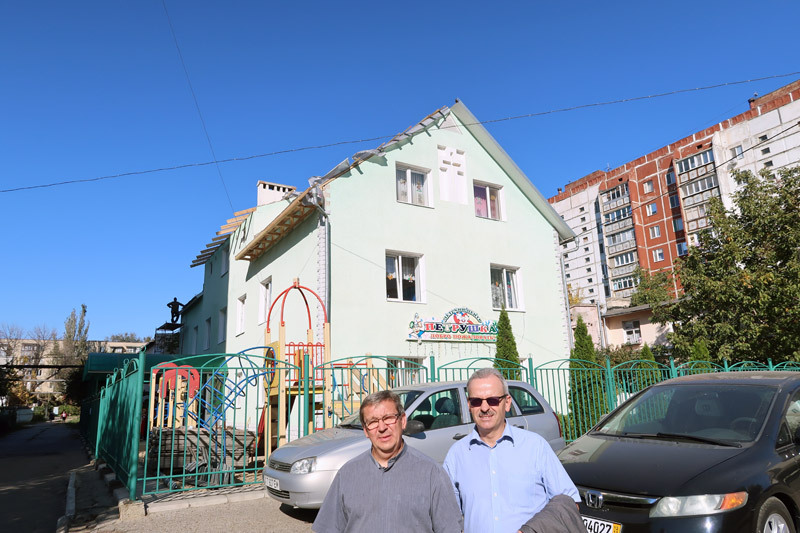 In period from 22 to 26 October 2018, Mr. Garst (President of HCN) and Mr. Hollenstein (vice-president of HCN), visited their projects for children and the day center for the elderly. All visited places are in a very good condition. They expressed their gratitude to the educators for the done work. On the occasion of the 15th anniversary of PRO UMANITAS (PU) Mr. Ghiletchii, vice-president of the Parliament of Republic of Moldova welcomed us in his office. During the conversation expressed his appreciation to the employees of PU and HCN for a huge support for needy children from Moldova. 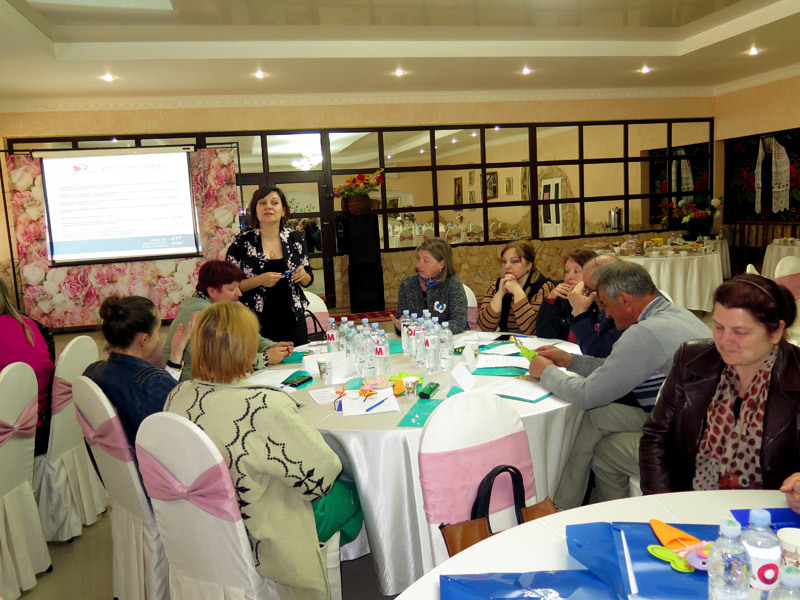 The 22st seminar for coordinators and educators of all 16 day care centers for children BUNVOLENTIA and day care center for children “Saint Maria” from Grigorauca took place today. There were 33 participants. 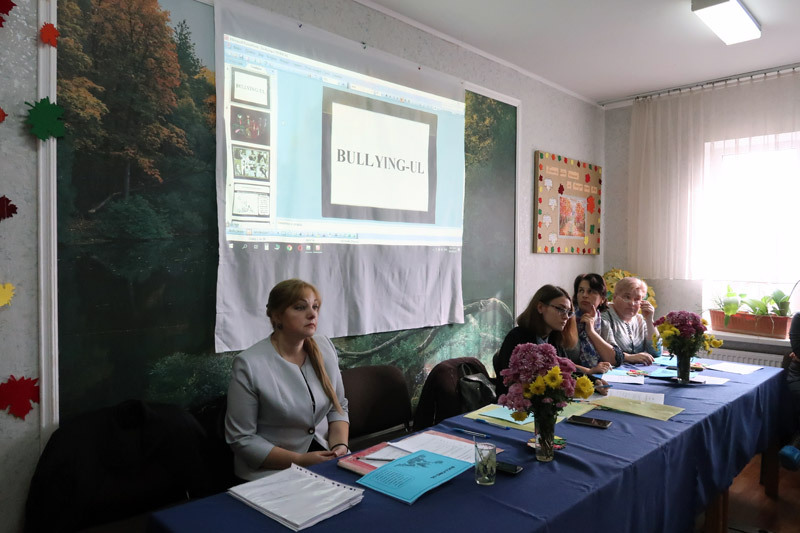 The seminar was attended by a specialist from the youth сenter for the prevention of violence against children “Pro Salva”. She gave a lecture to the present people. The seminar was interactive and informative. 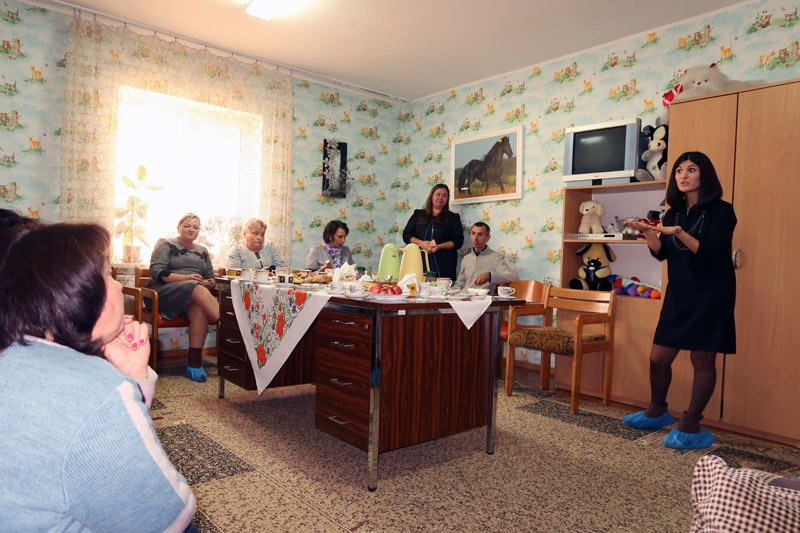 At the same time, a seminar for the accountants of the day care centers took place. In the second part of the meeting, the educators told about the results, proposed new ideas and activities with the children. They also expressed their wishes to improve the work process. 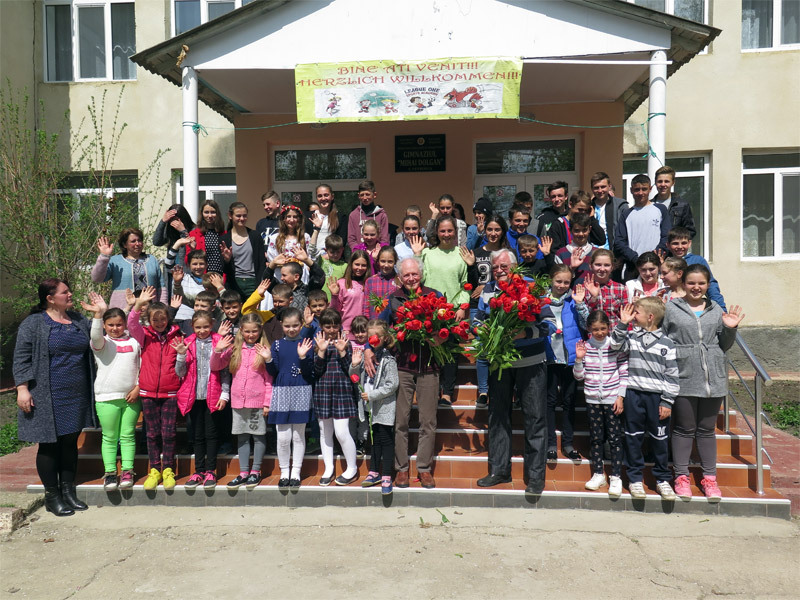 During his arrival to Tiraspol, Mr. Buescher (representative of the charity organization KINDERMISSIONSWERK, Aachen) visited the children's center "PETRUSHKA". The dear guest was met with bread and salt by children. Then he could acquaint himself with the activity in the center and the realized projects. Grateful children have prepared for Mr. Buescher a small concert. We thank all the friends and sponsors of PRO UMANITAS who have been accompanying and supporting us for fifteen years. Only thanks to your help we were able to realize many charitable projects. As the result, hundreds of the needy received the necessary and valuable help. May God reward you! 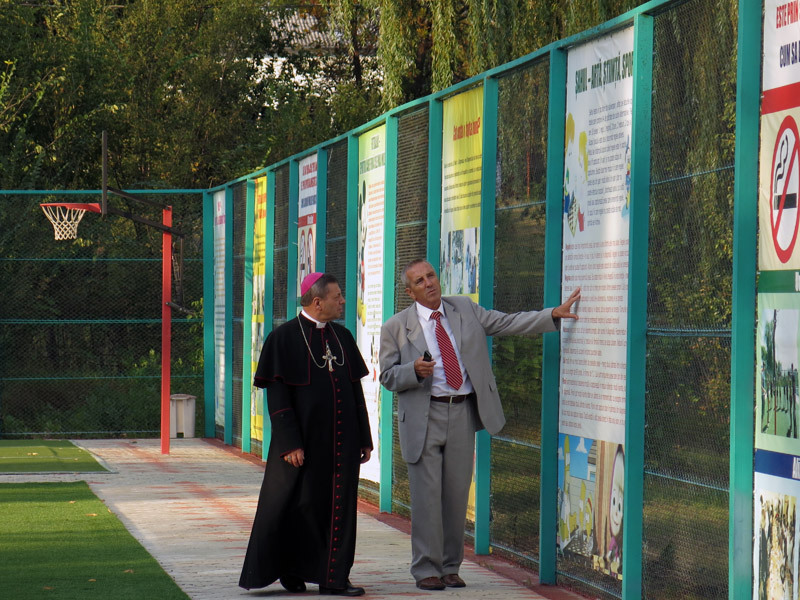 On the occasion of his visit to Moldova, Bishop Leon Dumbravschii, the Bishop of Ordinary of the Diocese of Kamianets-Podolsky, visited our Children's Center "St. Maria " in Grigorauca. Both, the center as well as the playground impressed him very much. "This is a paradise for children," he said. As he was leaving, he promised to visit the center again. 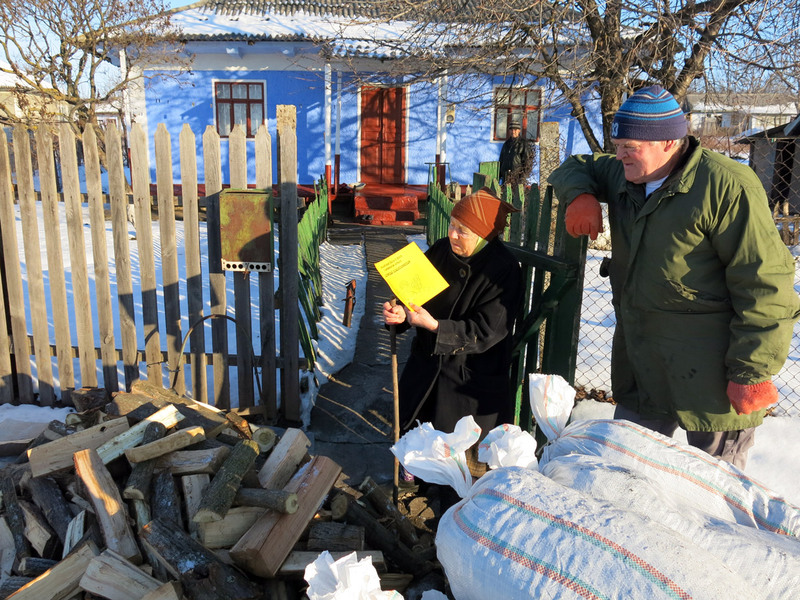 Yesterday, „PRO UMANITAS” received the humanitarian aid from Liechtenstein. These goods are intended for needy children, the old and poor families. This is a special help to the needy that gives them a great joy. 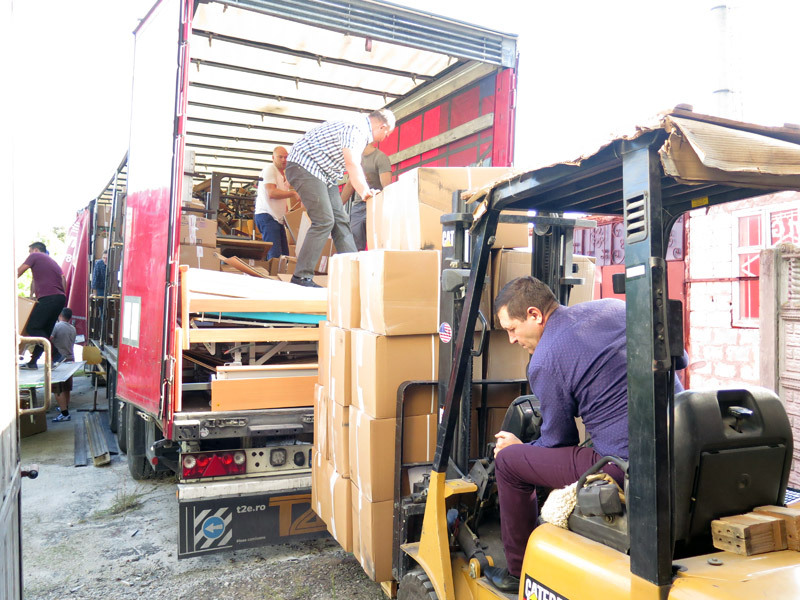 HILFSWERK LIECHTENSTEIN, president Bettina Pelger-Sprenger, delivered more than 16 tons of goods: clothes, linens, textiles, blankets, new shoes, new children's clothes, new toys, school furniture, stationery, beds, mattresses, tables, chairs, etc. Hundreds of poor people from Singerei district were distributed this aid. 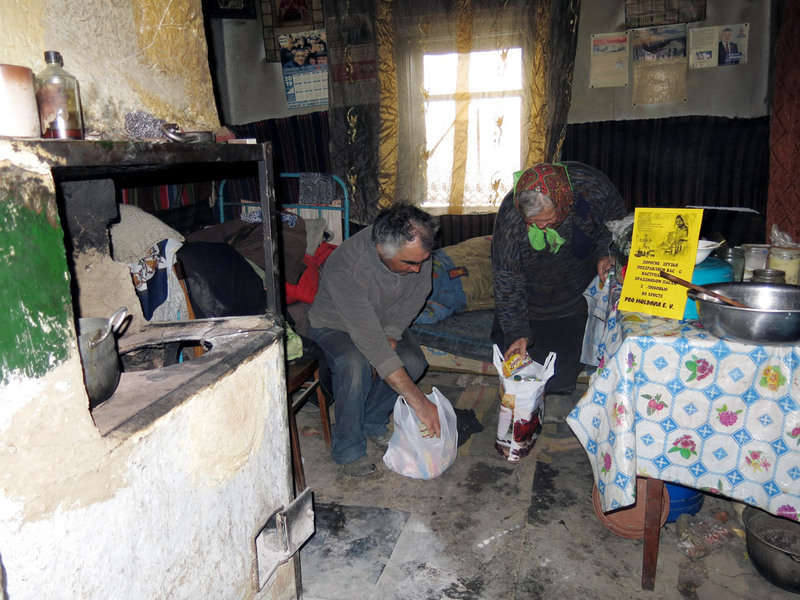 Bad and unhygienic conditions in the kitchens in Сozesti, Petrovca and Misovca were a big problem. There was a danger of closing these schools. The Health Service and the Food Safety Service warned the school administration about this. A healthy lunch that children receive at school is very important for their bodies and growth. 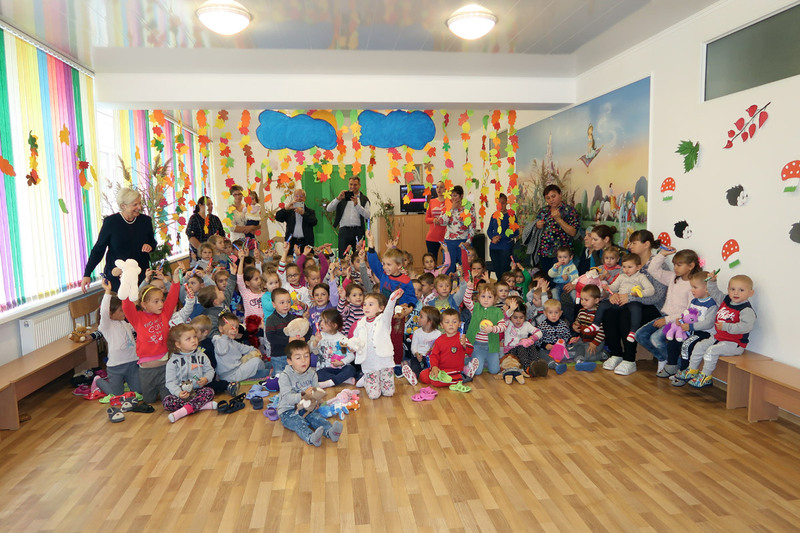 218 pupils, including 74 children from low-income families visit Day Center for Children BUNVOLENTIA after classes. This lunch is especially important for these needy children because this is often the only healthy food they eat. This is the reason why kitchens and canteens should be well-equipped. With the help of HILFSWERK LIECHTENSTEIN, we were able to buy the necessary equipment and equip the kitchens and canteens. Now, children eat in clean rooms. Food is prepared and stored in good conditions. We thank HILFSWERK LIECHTENSTEIN, the president Bettina Pelger-Sprenger, for financial support. The prime-minister of the Republic of Moldova highly appreciated the activity of PRO UMANITAS. 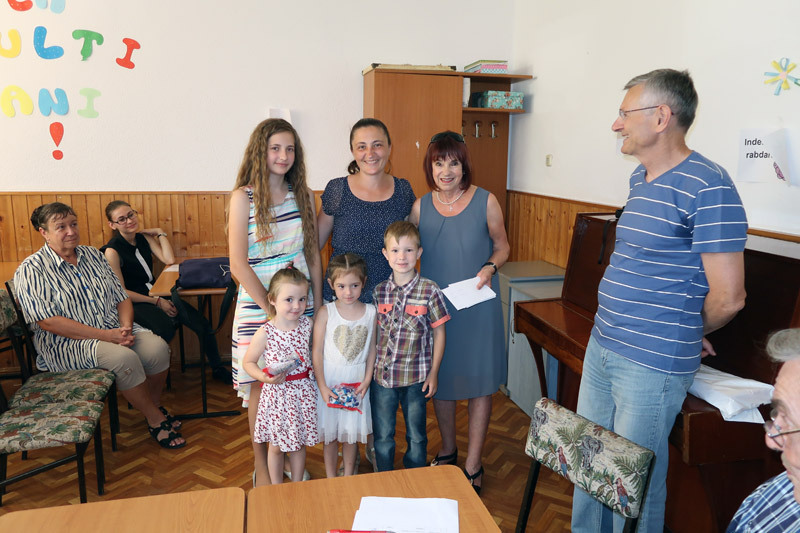 Mr. Filip awarded PRO UMANITAS with a first degree diploma for the achieved good results in the implementation of charitable projects, rendering assistance to needy people, and for the 15th anniversary of the PU's activities in Moldova. Employees of PU thank God and numerous partners for their invaluable contribution to the implementation of the realized projects. 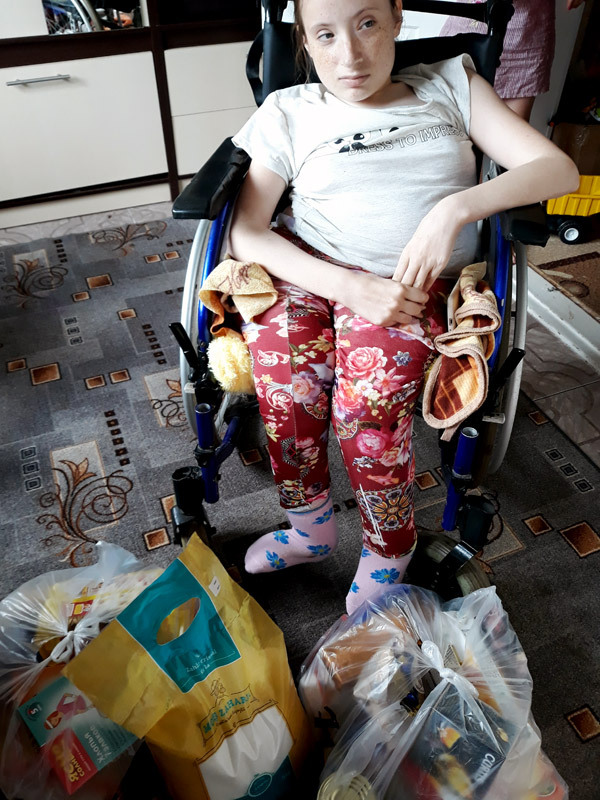 A pleasant surprise for 100 lonely, diseased, old people from Grigorauca: due to the financial support of Mrs. Ursula Honeck, Todtnau, Germany was possible to acquire and to deliver them food packages. The weight of a packet is 10,5 kg. The children of our DKC “St. 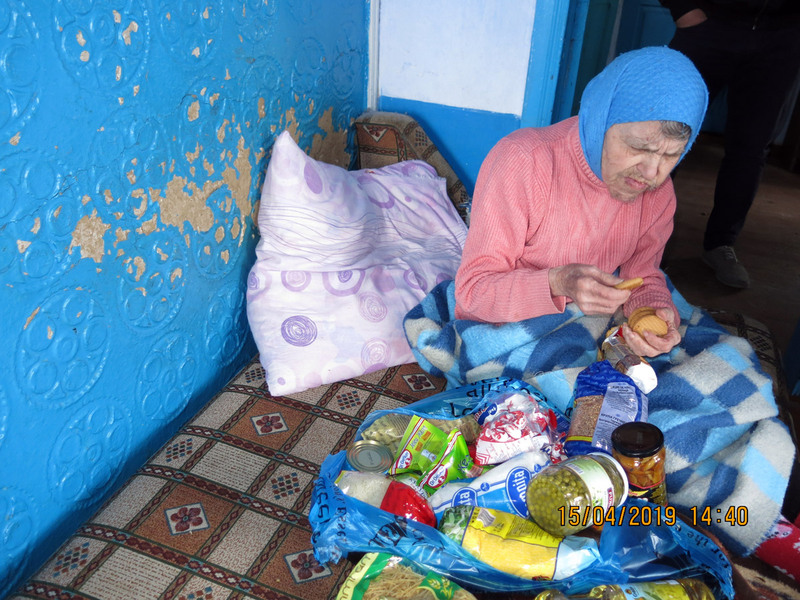 Maria” also participated in the distribution of food packages. 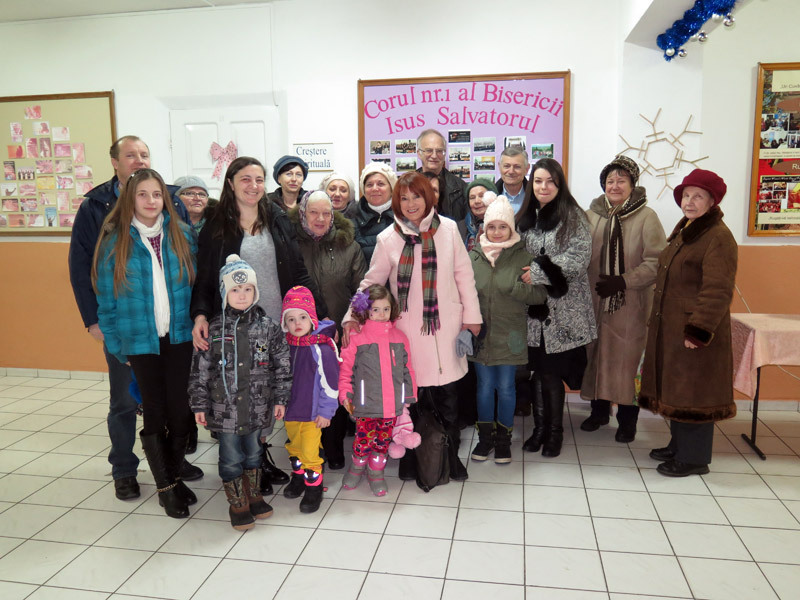 It is worth mentioning, that Mrs. Ursula Honeck has been helping needy people from Moldova for 23 years. 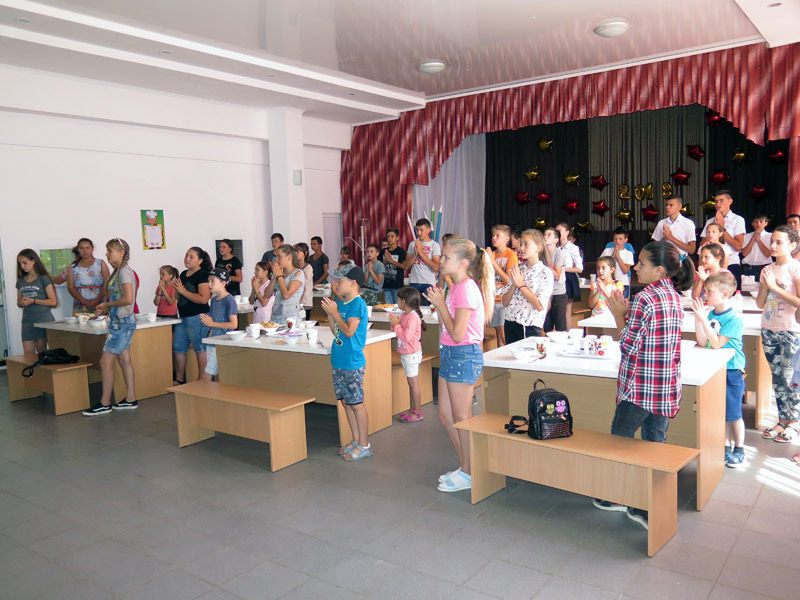 Summer camp (23.07.2018 – 03.08.2018) in Chisinau is a good opportunity for children from different confessions to pray together, to interact with each other, to take part in different excursions and challenges and to enjoy a varied diet and sweets. 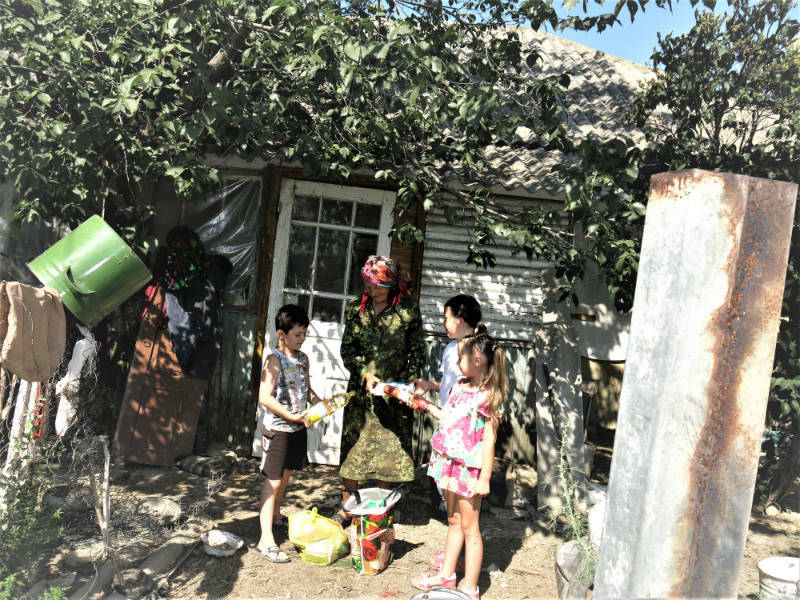 20 children from families in need from Chisinau have spent these days not just for entertainment but also for personal development. This Summer Camp was a wonderful holiday for these children. This project was possible to achieve due to financial contribution of Pater Erwin Benz from Swiss. 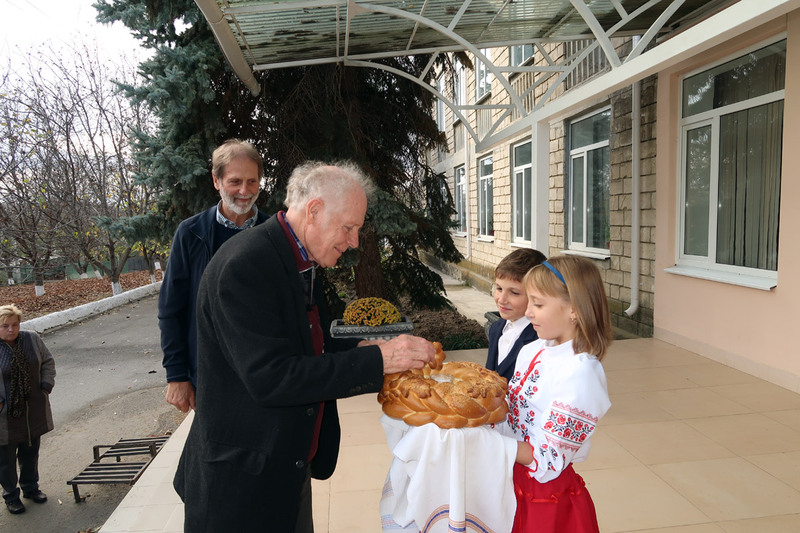 Father Clemens used the opportunity to visit the village Khomutianovca, during his staying in Moldova. During the last New Year's Fair, he together with his assistants had been selling different Bavarian products for 2 days. 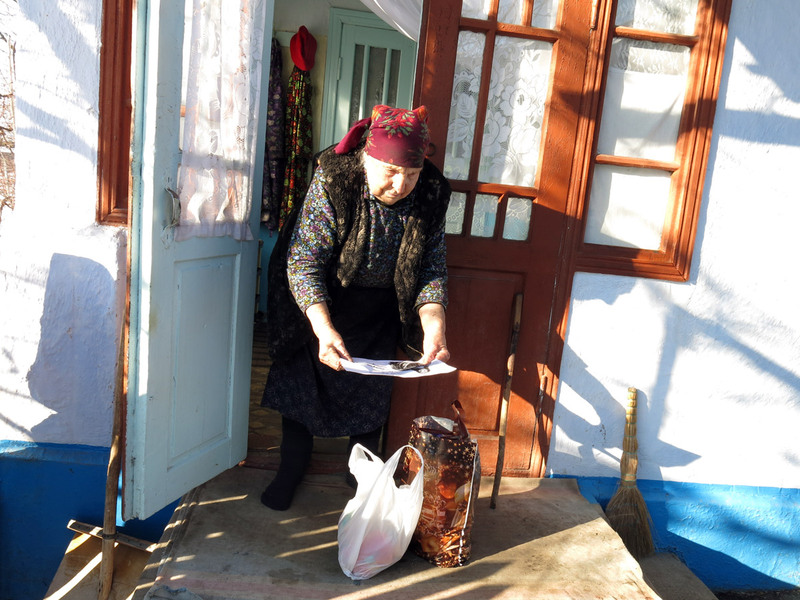 The earned money was sent to poor people from Khomutianovca. 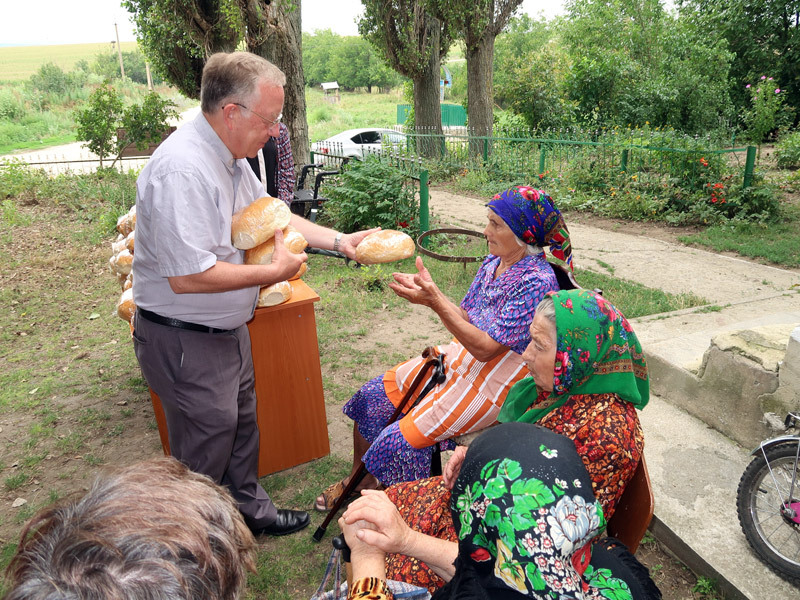 In village Father Clemens met people and gave them bread personally. The artificial grass for the football stadium was first arranged in 2010. It was a gift from the Football Federation of Moldova. After 9 years of exploitation its quality degraded. This is why it was necessary to renew and to arrange 640 m2 of artificial grass. This project was financed by Father Erwin Benz, Gemeinde Baar (Switzerland), Father Hans Bock and “Menschen Helfen e. V.” (Germany). 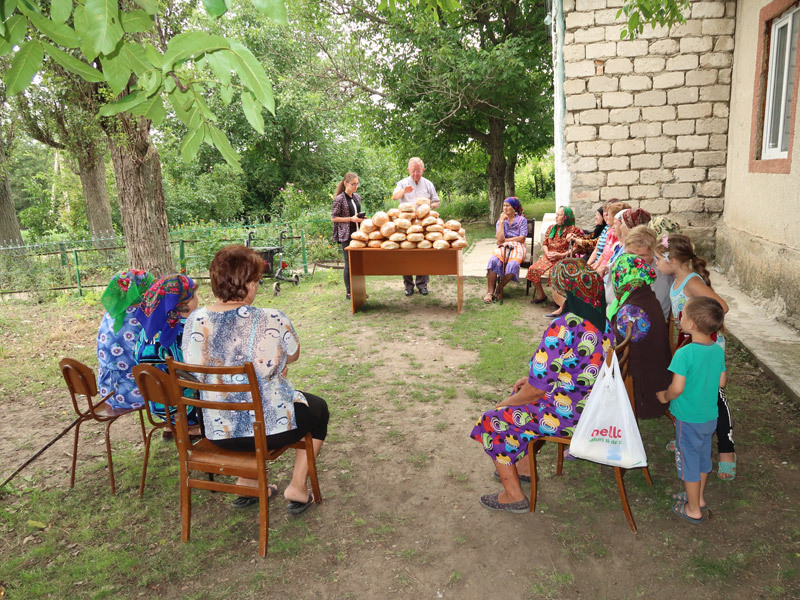 27 families from Moldova have been getting the financial help for 23 years. It is possible due to German charity organization whose president is Mrs. Ursula Honeck. This organization have realized a lot of projects that help needy people. 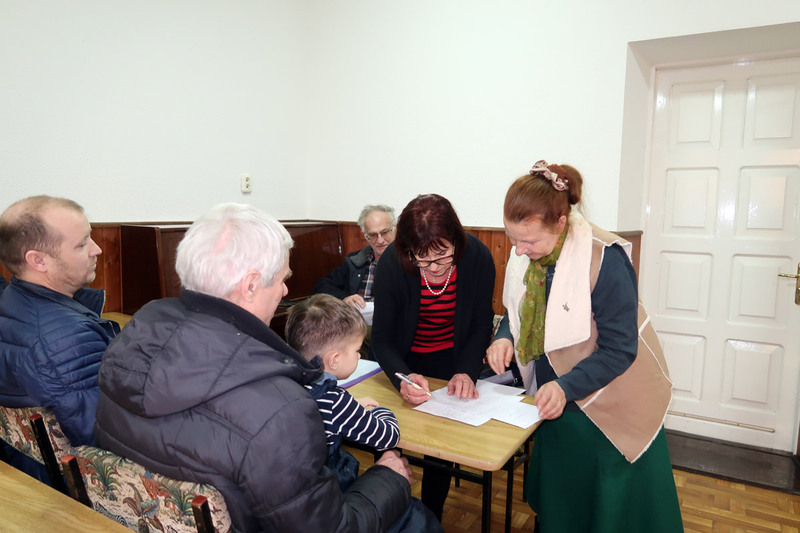 Mrs. Honeck together with Mr. Köllner have come in Moldova in order to distribute the financial support to the sponsored families. 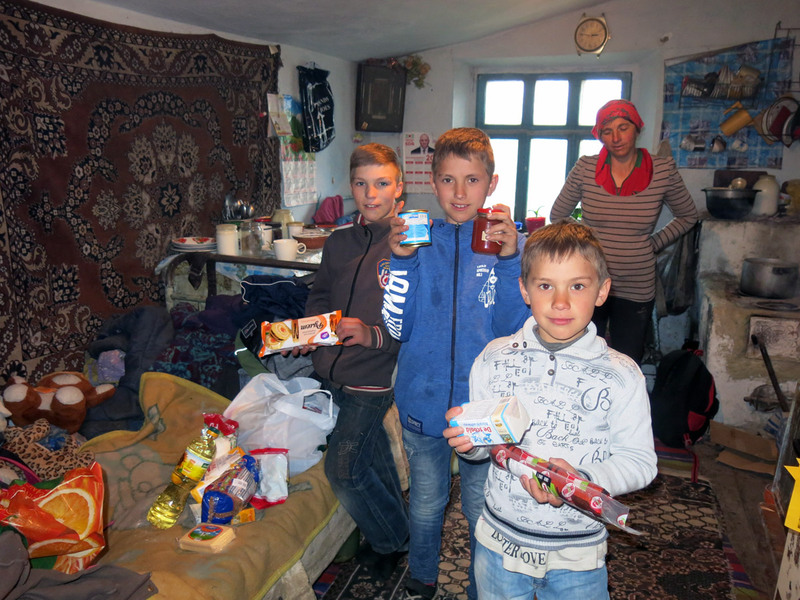 18 physically and mentally disabled kids from the region Singerei got product packages. This action was financed by the Franciscan community from Austria. 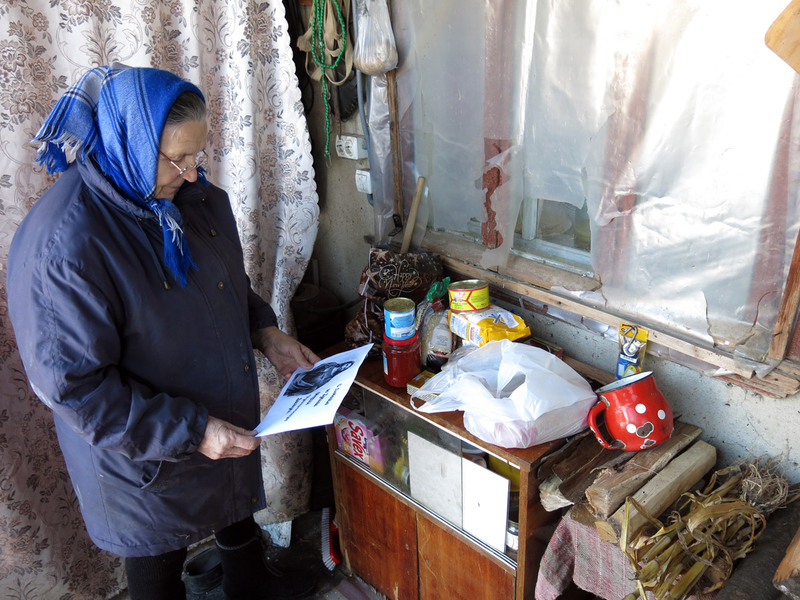 Food packages have been distributed between 100 poverty-struck families. Each package contains 15 basic food products and weights 18 kilograms. Campaign was held in commune Gangura. 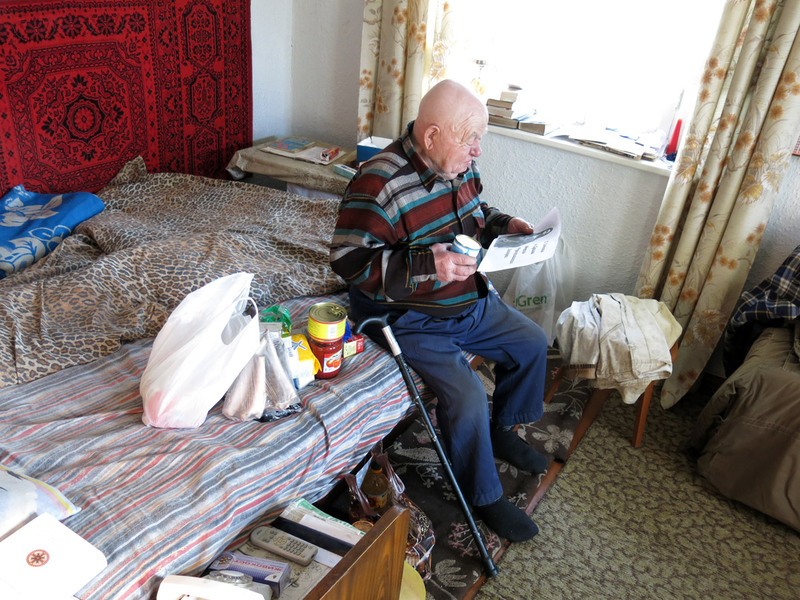 Elderly people took the packages with tears in their eyes. This campaign was organized thanks to the financial support of the family Zuhlke from Switzerland. Every year children look forward to summer holidays. It is the best time for them since this is when a lot of inside and outside events are being organized for them. 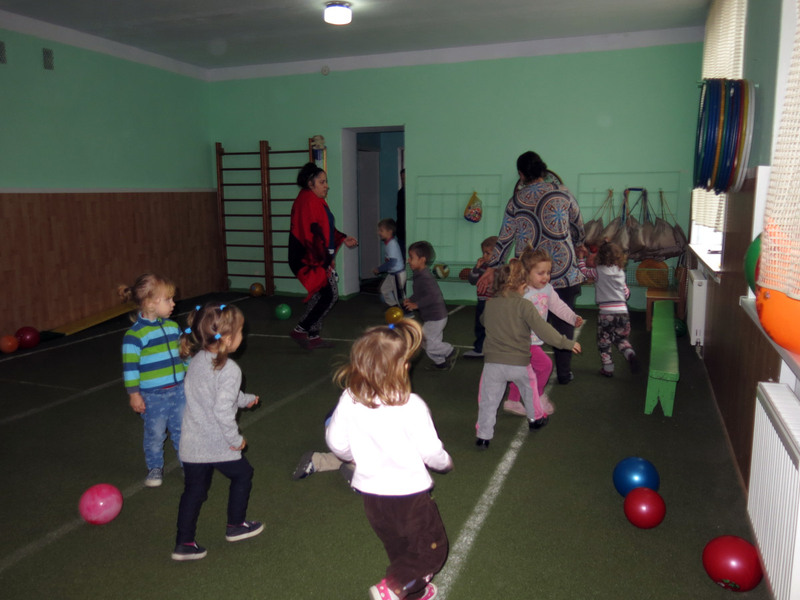 BUNVOLENTIA Projekts and Day care Center for Children „Saint Maria” offer chldren a lot of activities. 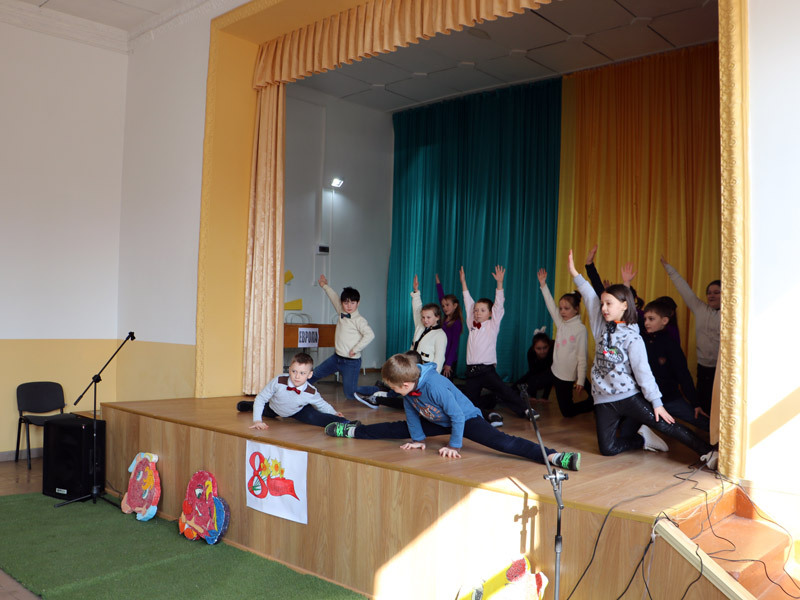 Thus, they can learn something new by singing, dancing, painting and, of course, taking part in a variety of interesting and fun competitions. 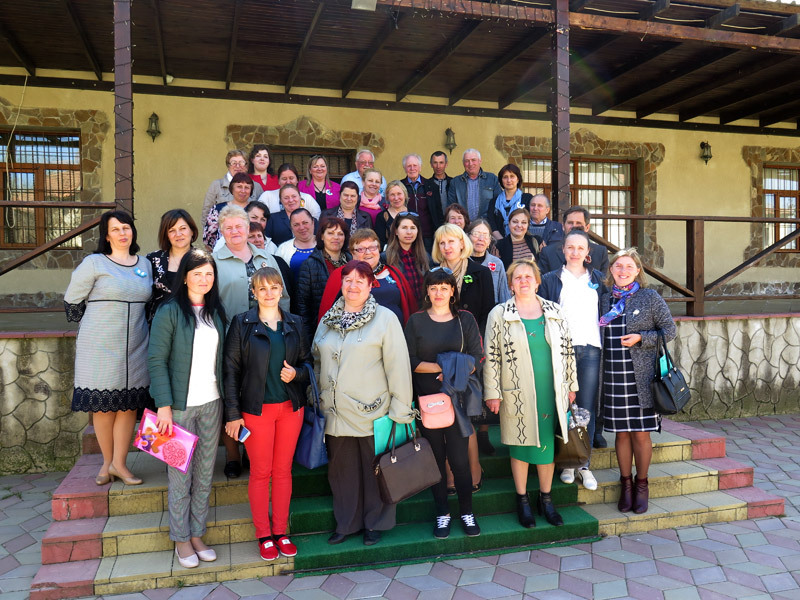 Teachers make plans for each day including excursions within Chisinau and to other beautiful places of the Republic of Moldova. This way children and teens are motivated to learn useful material while playing games. 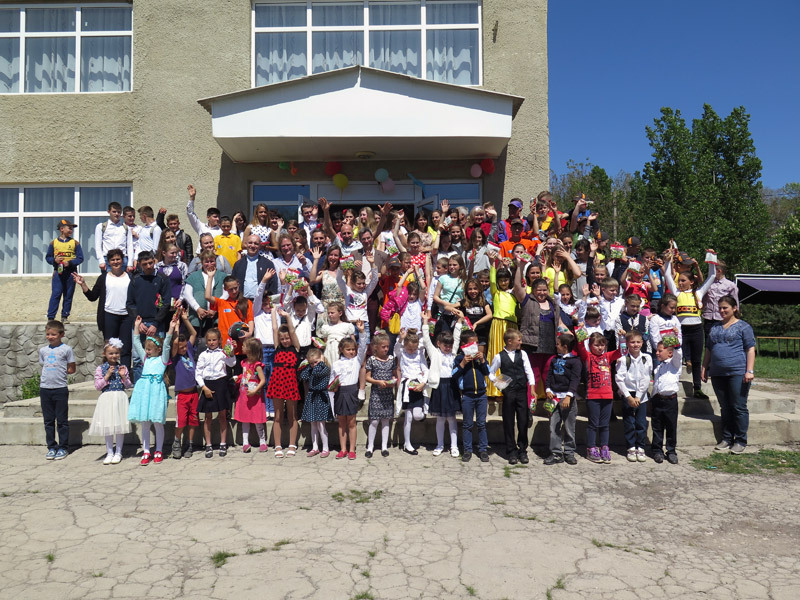 Children from three schools in Mihailovca, Petrovca and Misovca received a wonderful gift on Children’s Day. 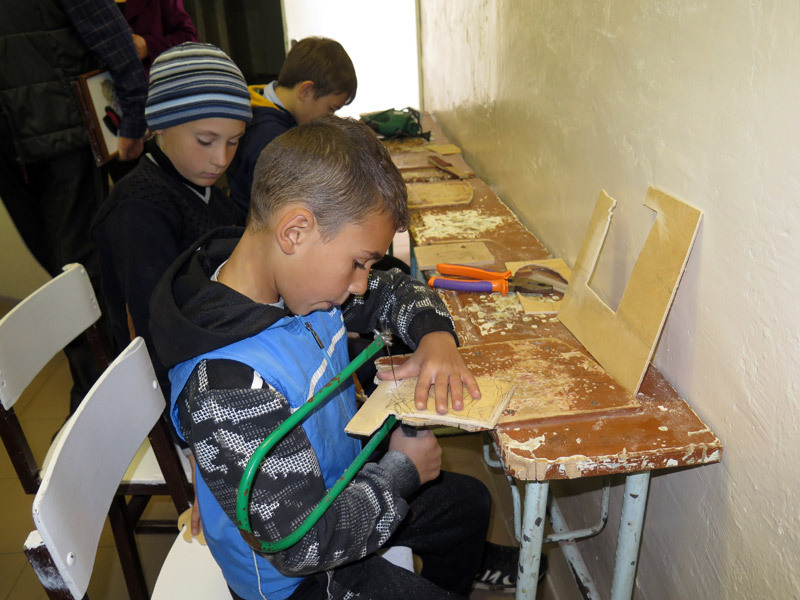 New furniture – tables, benches and cupboards – was ordered and installed in the dining rooms of the mentioned village schools. There used to be not enough chairs for all children. The furniture was old and damaged. Now they will enjoy their meals in pleasant conditions. 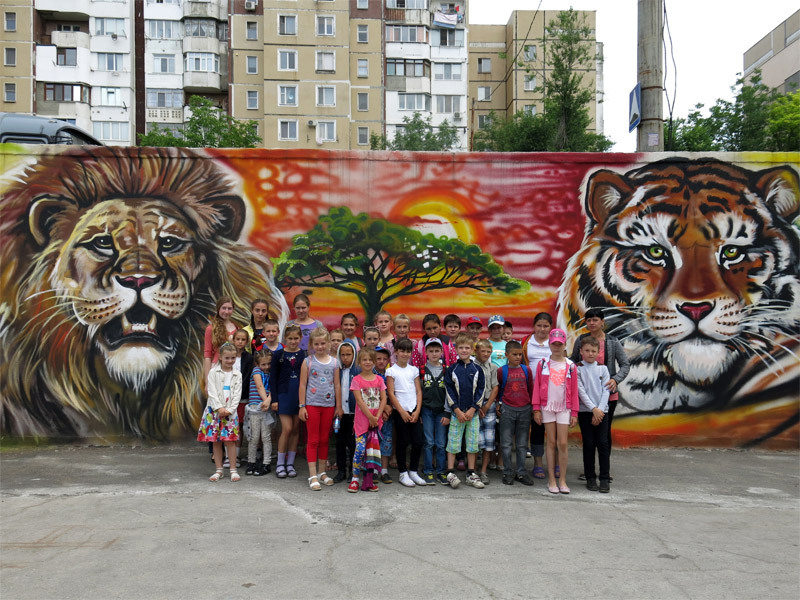 A total of 214 children benefit from this project. 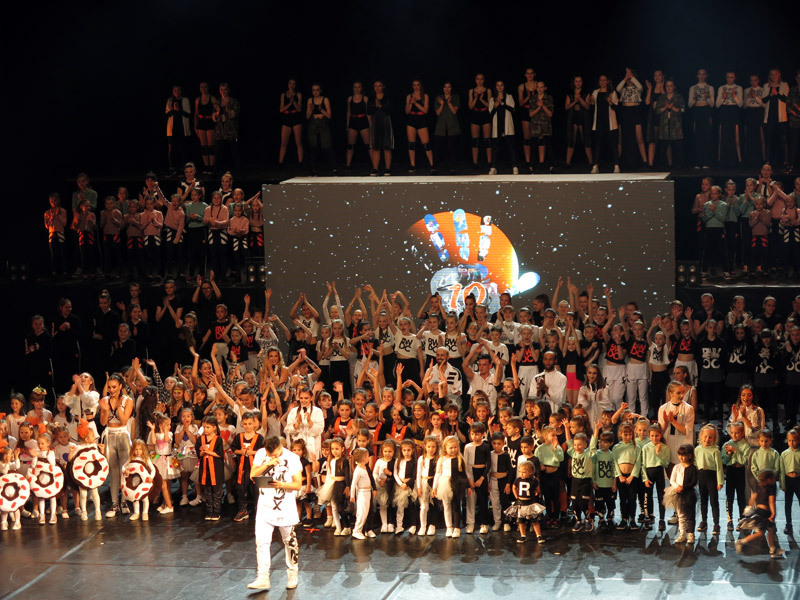 This project was possible thanks to priest Erwin Benz, Baar / Switzerland. 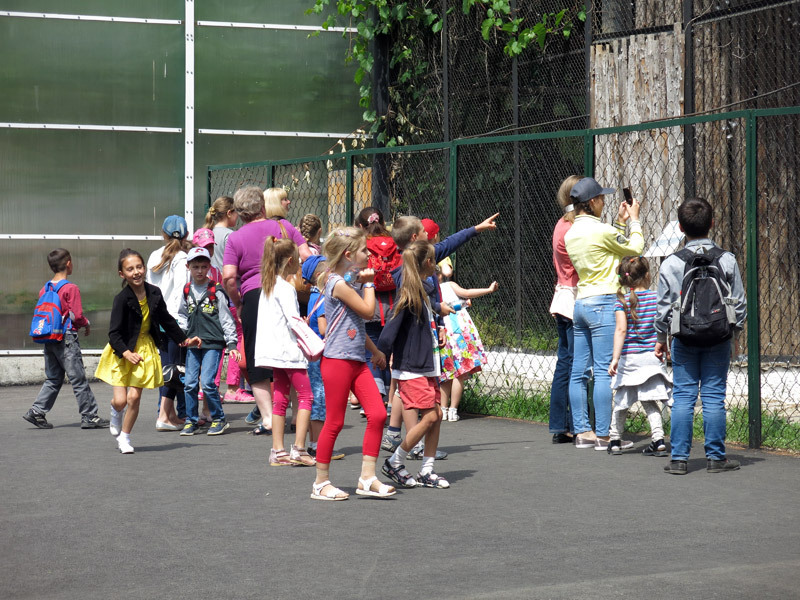 During the last visit of “Menschen Helfen e.V.”, Murnau, the president of the organization, Dr. Robert Roithmeier allowed that the children of the day care center “St. Maria” from Grigorauca take a trip. Promise – done! 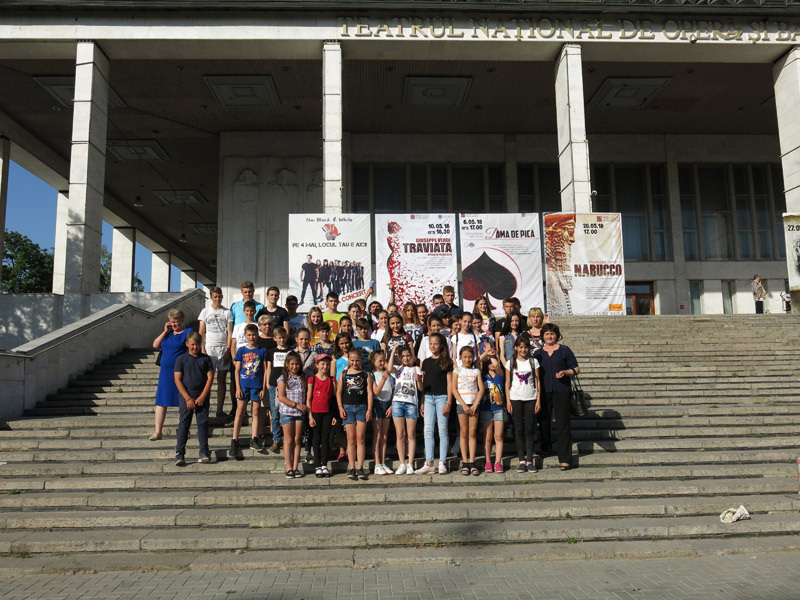 On Friday, 04.05.2018, the children were in Chisinau at the Opera Theater, where a great dance performance of a famous dance group from Moldova took place. They were very impressed with the opera theater and the whole show. 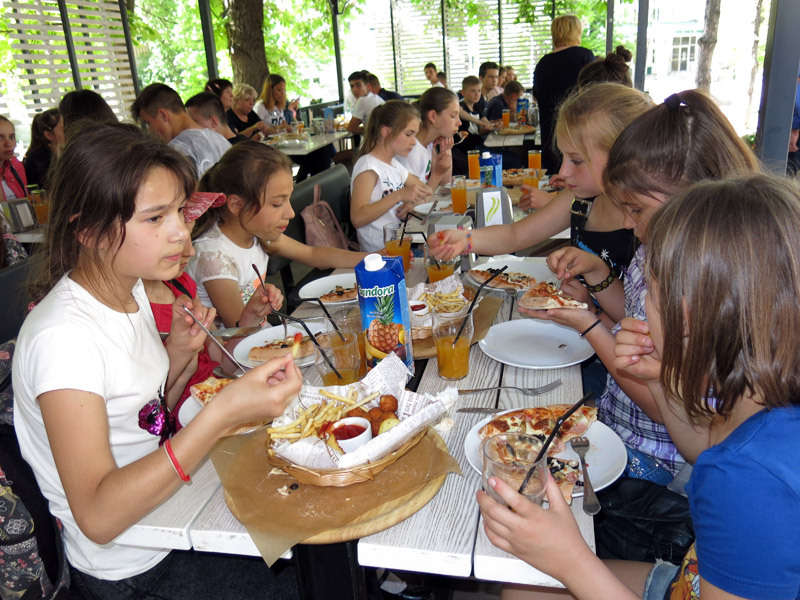 The children could also enjoy a delicious meal in a pizzeria. 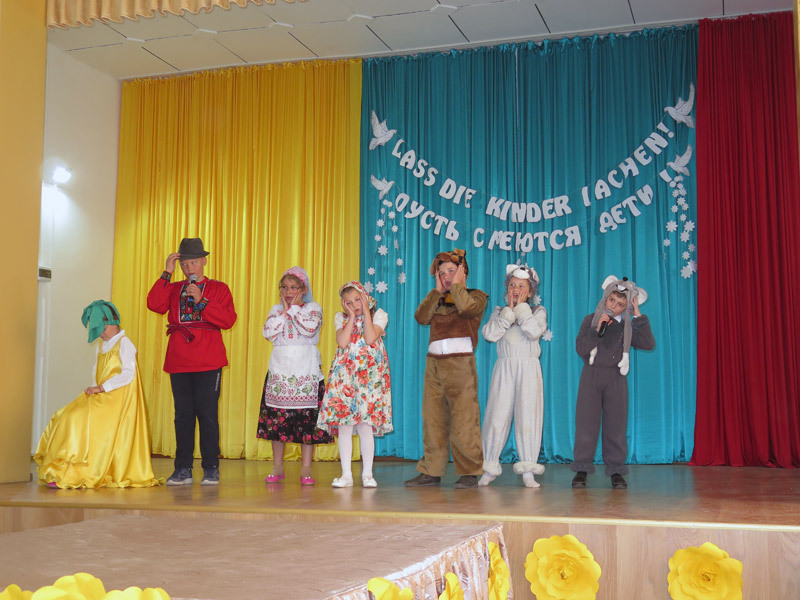 This trip was a reward for the wonderful performance and great work of the children during the visit of “Menschen helfen e.V.”. In total, 52 children and companions were included. 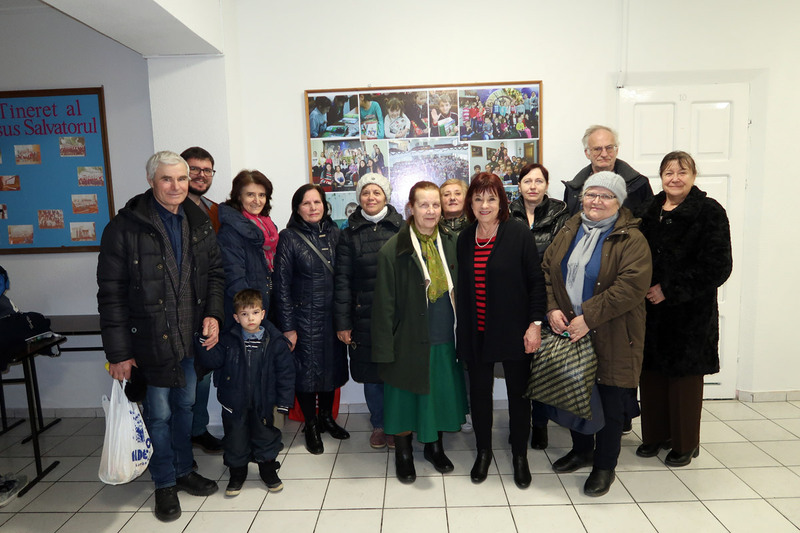 A group from “Menschen Helfen e.V.”, Murnau led by the president Dr. Robert Roithmeier visited Moldova at the end of April. 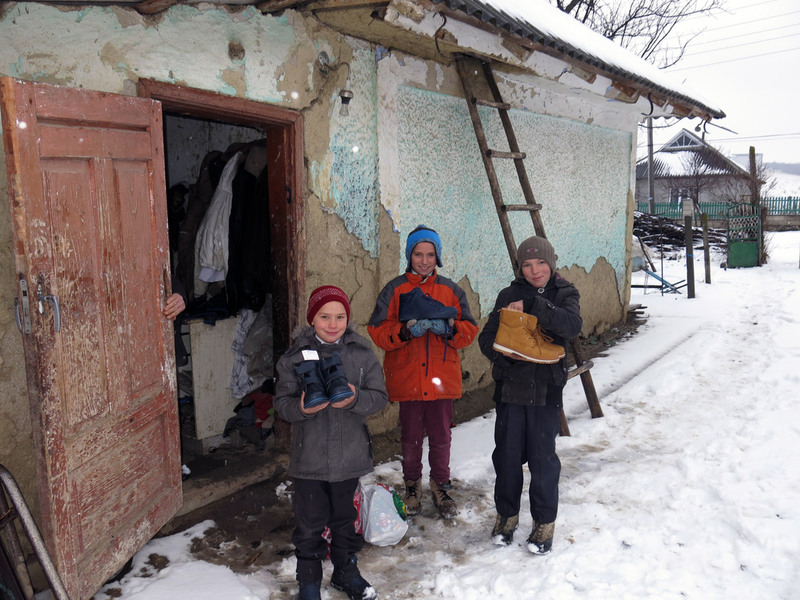 Despite difficulties with the flight they could trip to Grigorauca in time, where the children of the day care center “St. Maria” were waiting for them impatiently. They prepared a great feast for the guests. 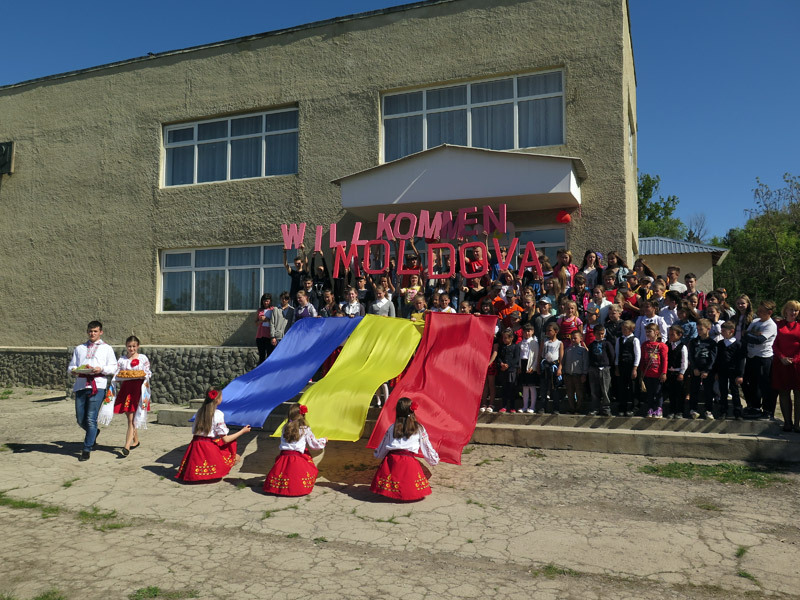 The group was welcomed with a beautiful dance with ribbons in colors of the Moldovan flag. 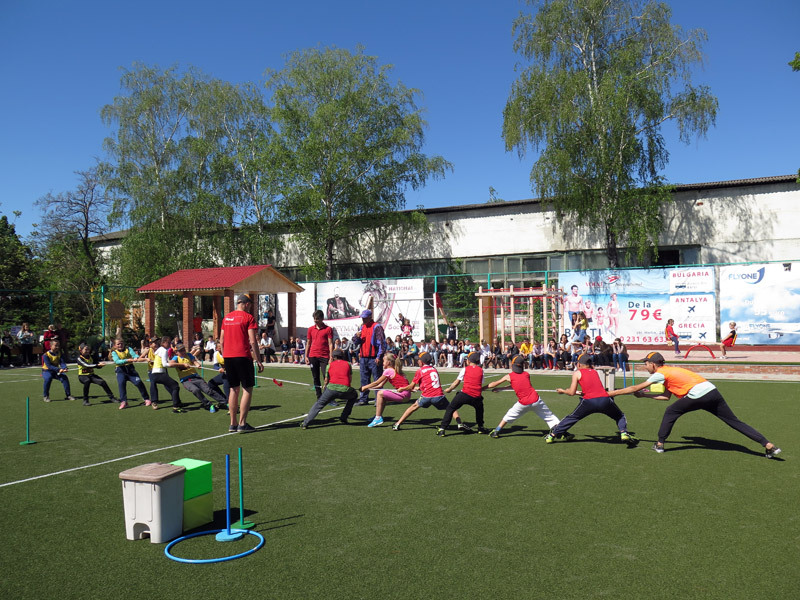 On the sports ground were organized sports competitions “Funny Races”, where the team “We are super!” fought against the team “Sunshine”. 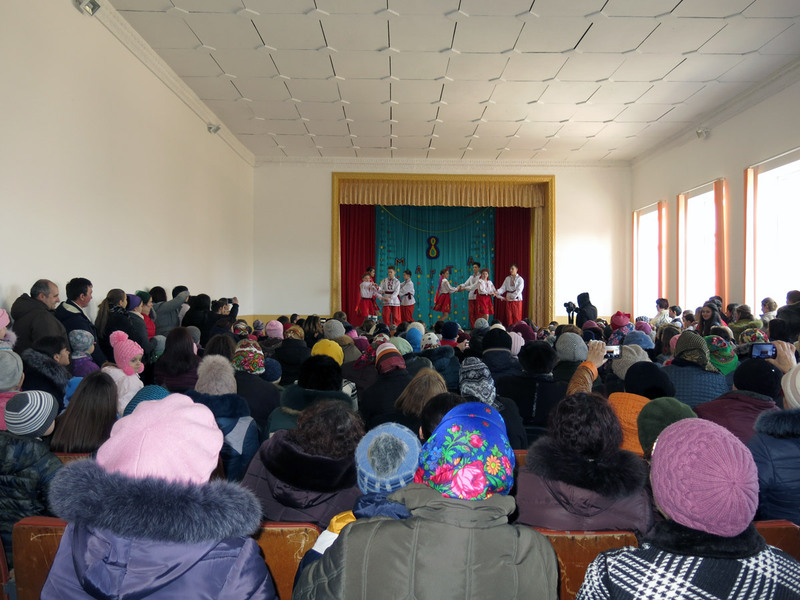 A wonderful performance with dances and songs rang in the culture house of the village. 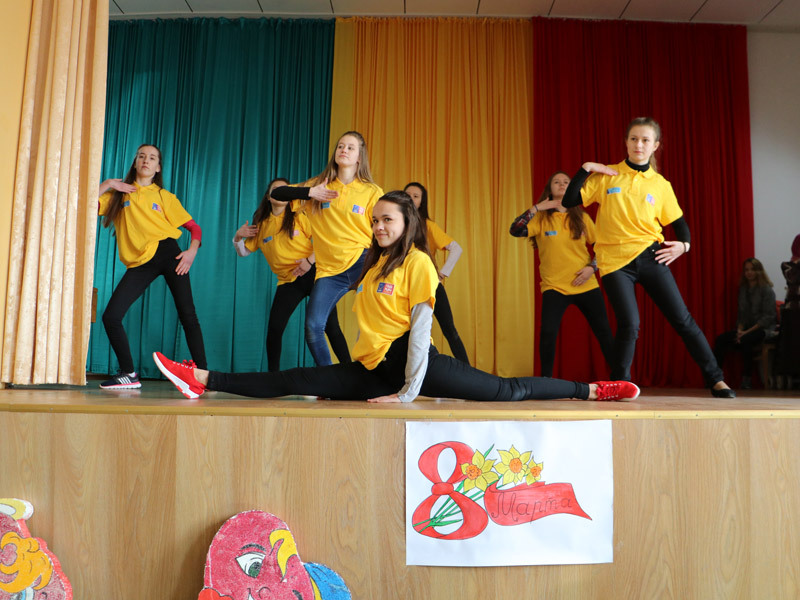 As part of the presentation, a fashion show was presented; the girls from the sewing course sewed clothes for themselves, as well as costumes for different dances. 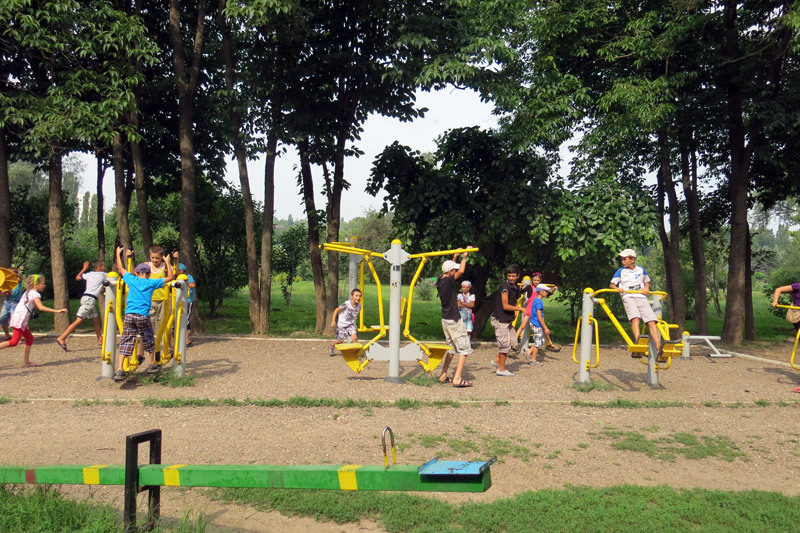 The guests could also observe the children of the center during their daily activities. In addition, the group visited the little Artiom Spalatu. “Menschen Helfen e.V.” finances the treatment (chemotherapy) of the boy. They met the whole family and were happy for the joyful child. 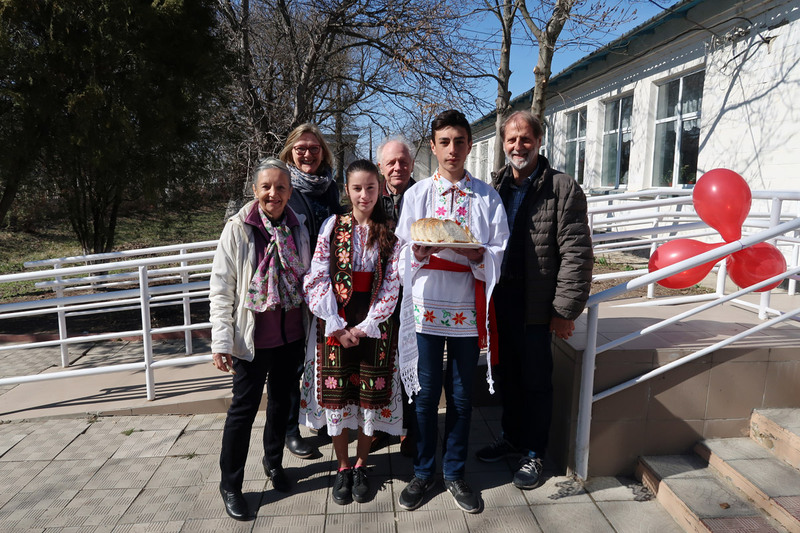 The President of “Help for Children in Need” (HCN), Evilard, Mr. Peter Garst was between 17.04 and 23.04.2018 on his 30th anniversary visit to Moldova. He was accompanied by Mr. Heinz Luginbühl. 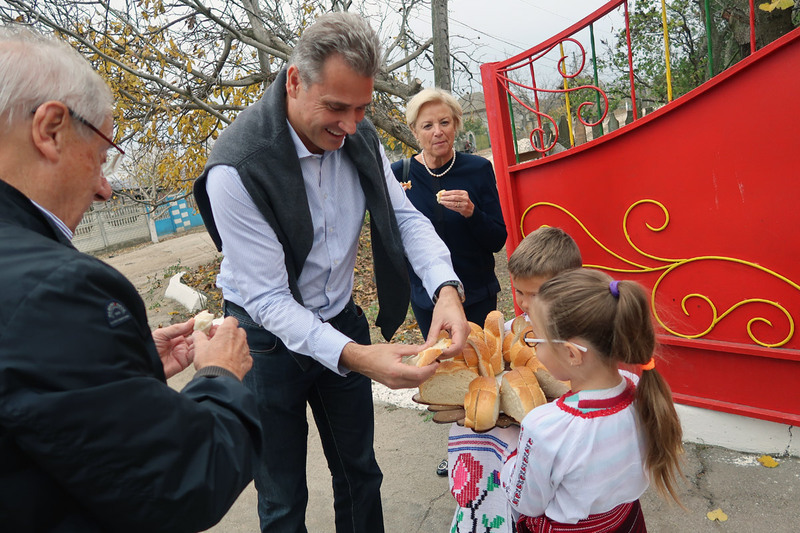 During this visit, they visited all 16 day care centers for children BUNVOLENTIA. Everywhere Mr. Gast and Mr. Luginbühl were welcomed with bread and salt, as well as with many flowers. 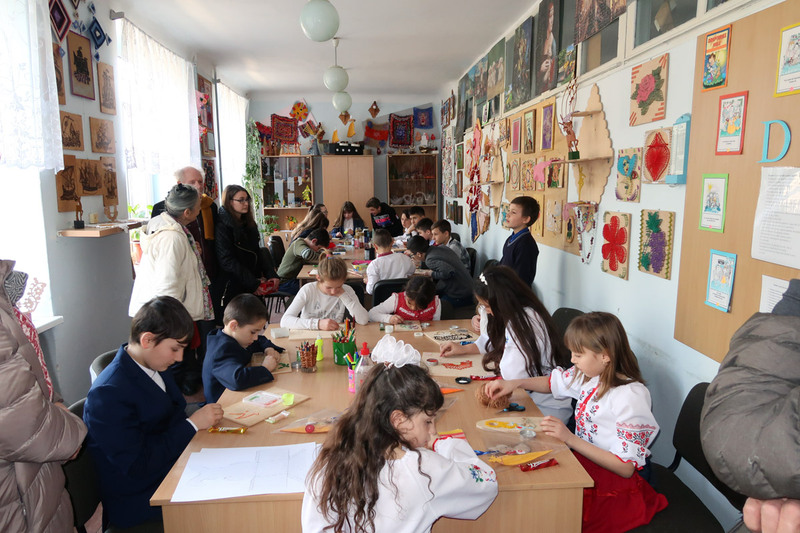 Each day care center organized a beautiful exhibition with the last children’s works. Mr. Garst and Mr. Luginbühl also visited the day center for elderly “Sf. 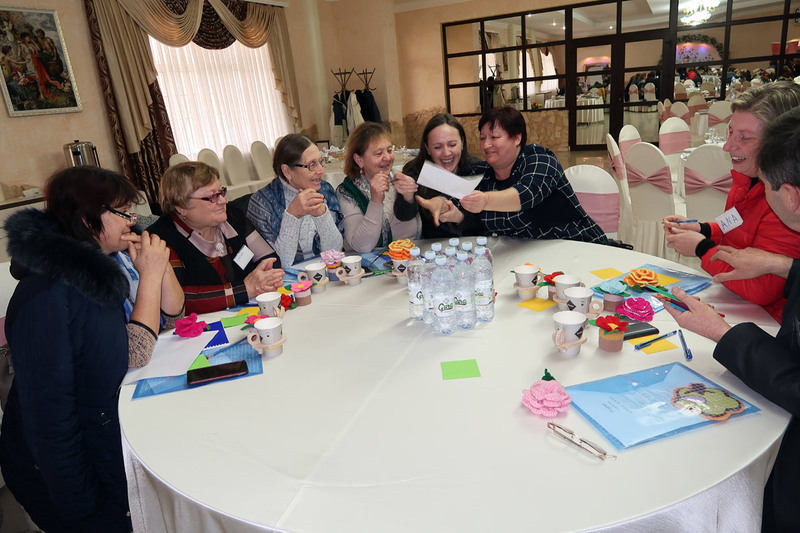 Petru” in Grigorauca, participated in the 21st seminar for coordinators and educators of the day care centers BUNVOLENTIA and met godchildren in Tiraspol, Transnistria. 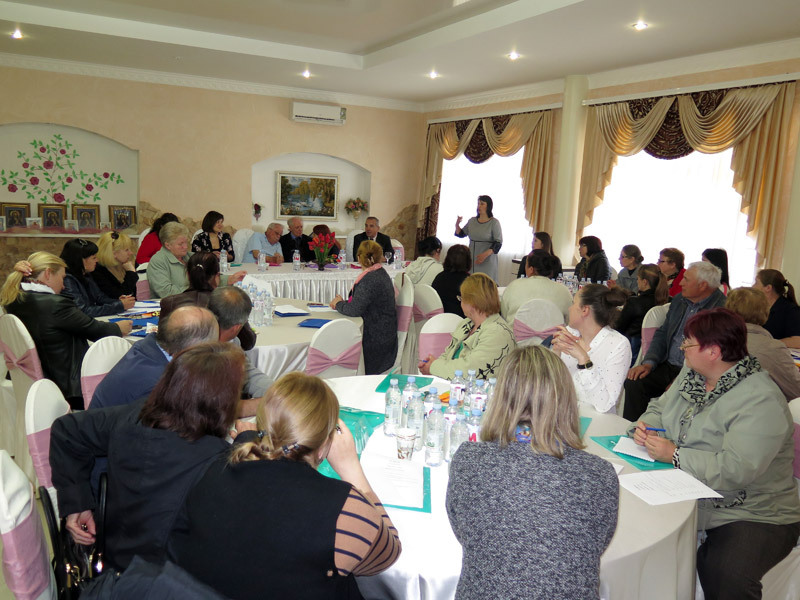 The 21st seminar for coordinators and educators of all 16 day care centers for children BUNVOLENTIA took place today. There were 39 participants. As guests of honor were warmly welcomed Mr. Peter Garst, the president of “Help for Children in Need” (HCN), Evilard and Mr. Heinz Luginbühl. 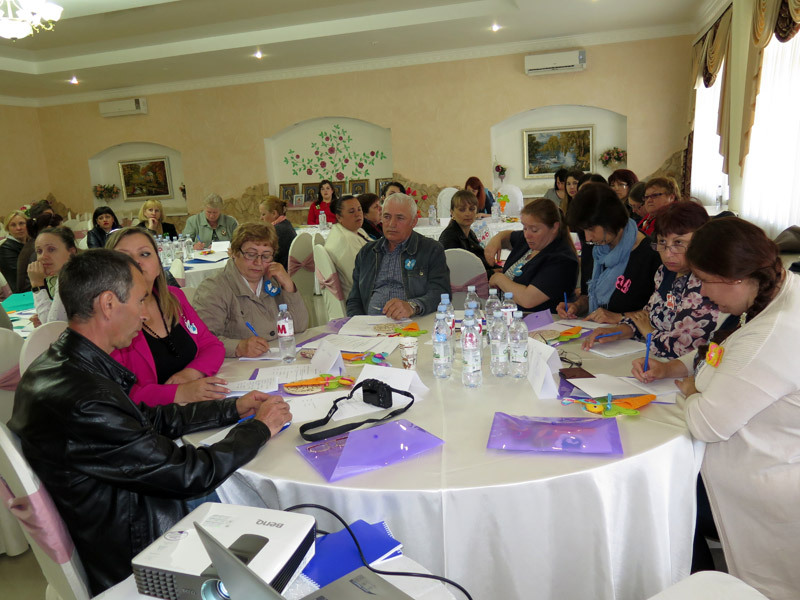 The seminar was attended by a specialist from the “National Center for the Prevention of Violence against Children”. She gave a lecture to those present. The seminar was interactive and informative. In the second part of the meeting, the educators told about the results, new working ideas with the children. They also expressed their wishes to improve the work process. 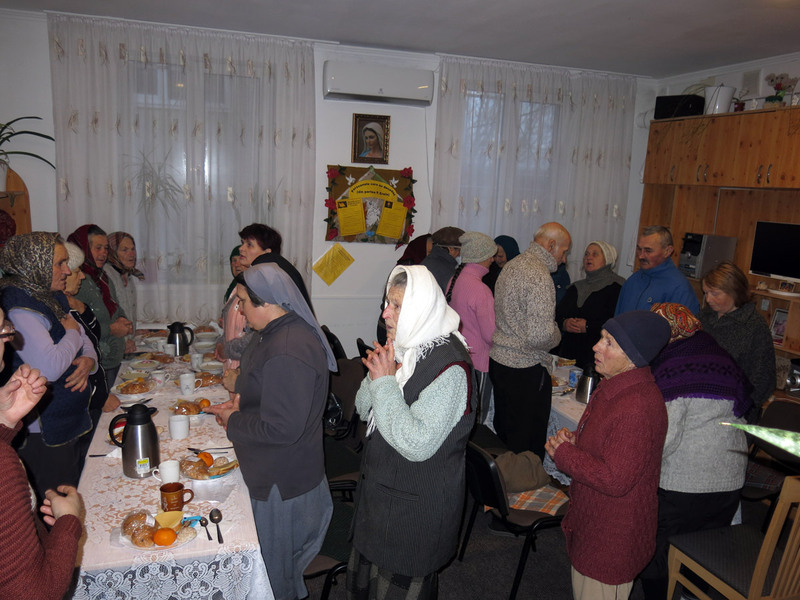 A beautiful feast took place in the village Grigorauca on March 8, 2018. 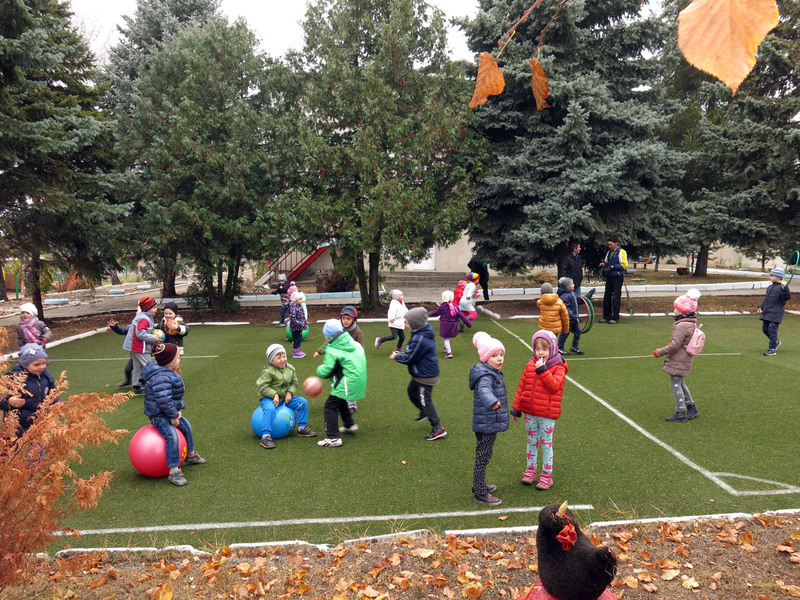 The children from the day care center for children “St. 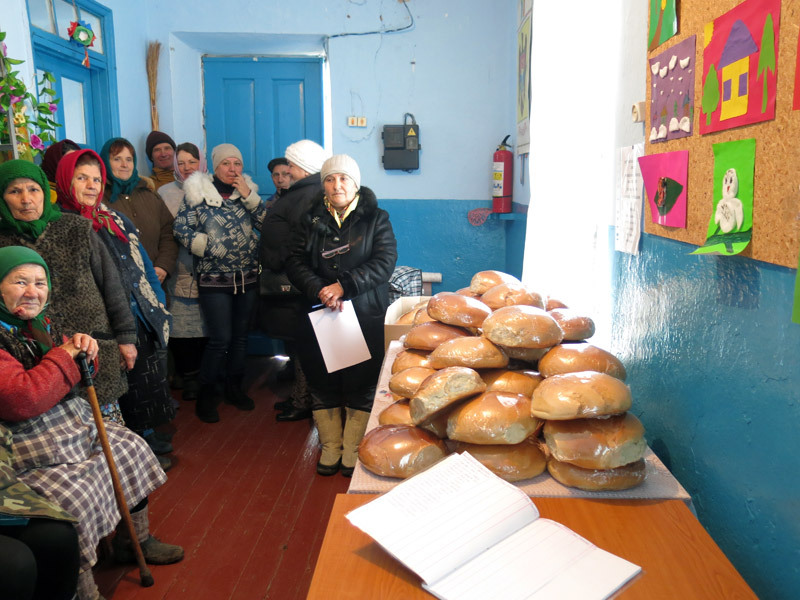 Maria” congratulated all women of the village with the Women’s Day. 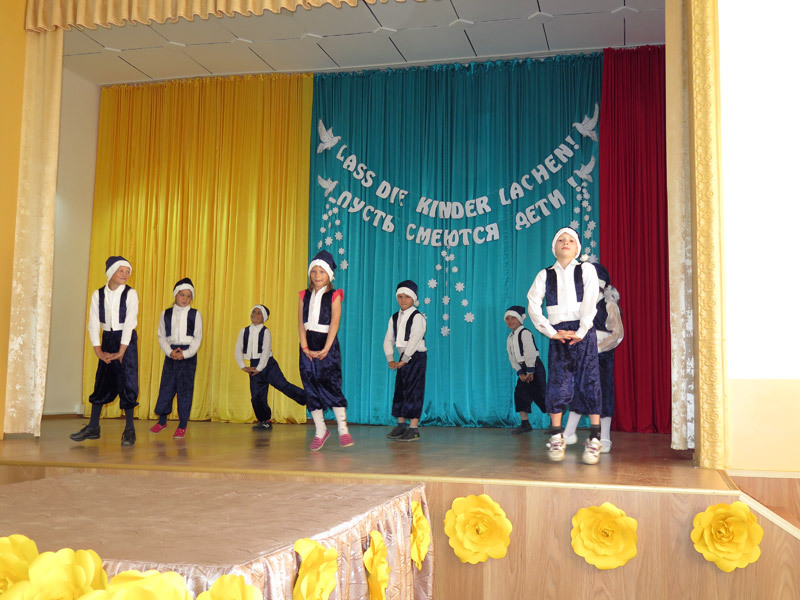 They prepared a great performance with dances, songs and puppet theatre. The children made with joy and love presents for their mothers, grandmothers, sisters and women from the village. Despite the coldness the hall was full. All present enjoyed this wonderful day! 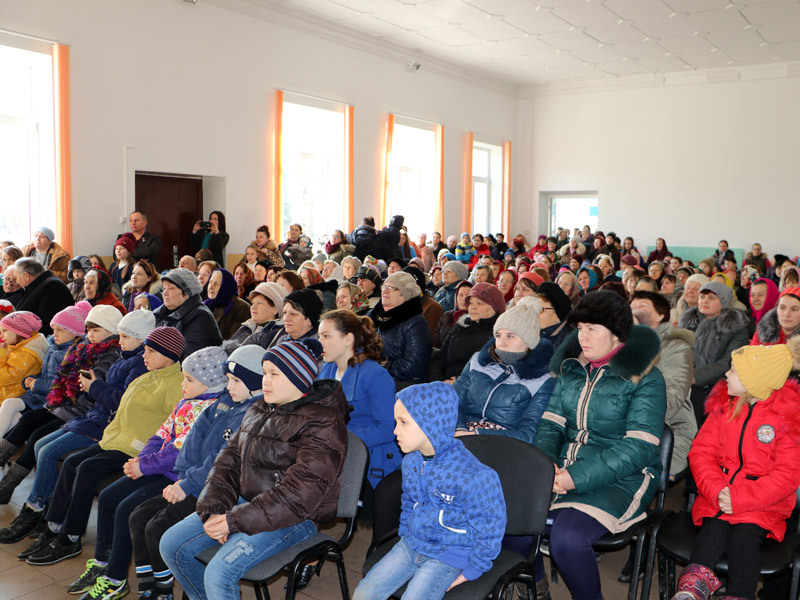 The general annual meeting of the Charity Association PRO UMANITAS (PU) took place on February 23, 2018. The President of PU, Mr. Vladimir Nadkrenicinii, reported in front of the members about the Association’s activity during the year 2017. Within the meeting the annual budget 2018 was approved. It was also mentioned that PU will celebrate its 15​th​ anniversary this year (on October 8, 2018). 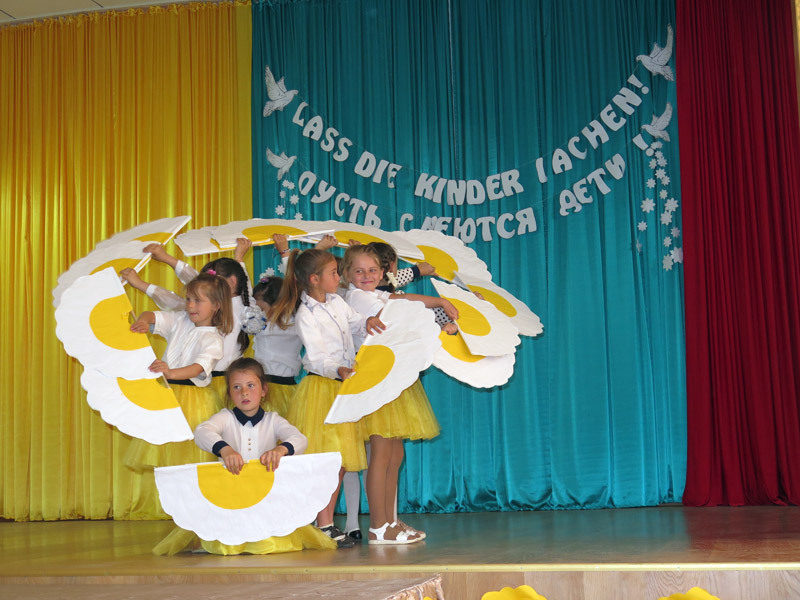 “Bread for the breadless” is a wonderful action financed by Pro Moldavia e.V., Gladbeck. Beginning with February 2018 the second action is implemented in the village Homuteanovca, district Ialoveni. 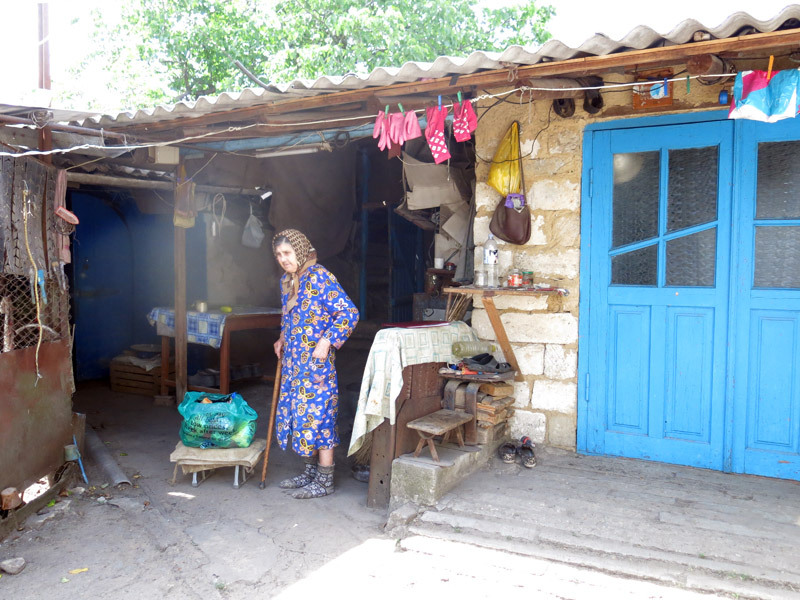 The village Homuteanovca is a very small and poor village with 122 inhabitants. Many of them work abroad or in other regions. 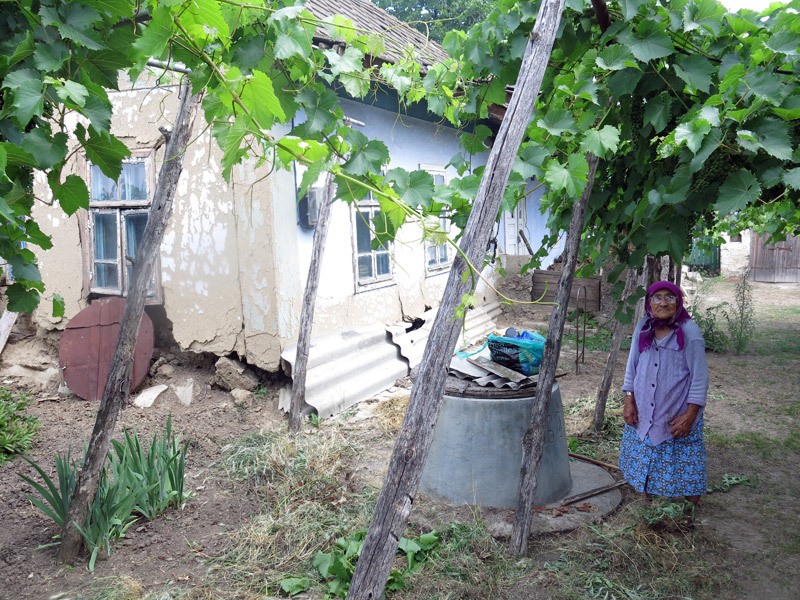 Almost only old people remained in the village that receive no help. The project in bread supplying is very important. Thus, 25 poor, old, ill, disabled people are supplied with the daily bread. The beneficiaries are very grateful for this help. 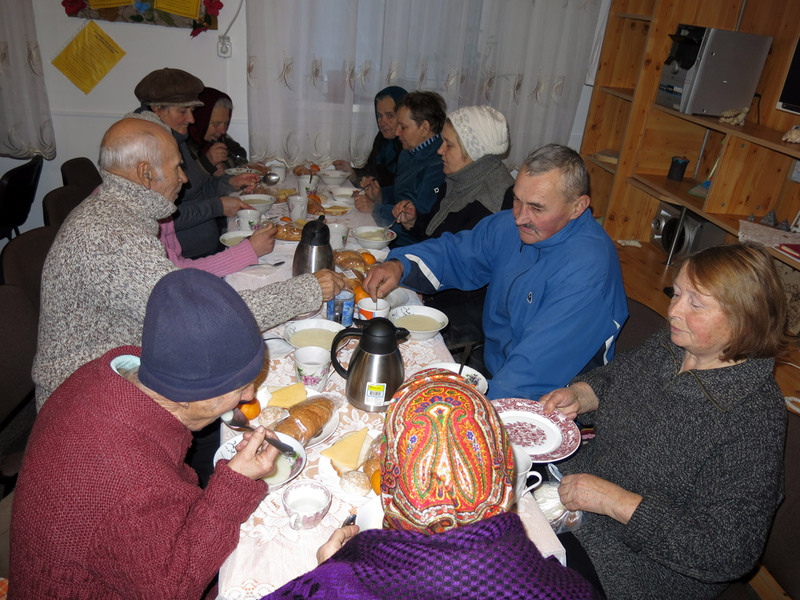 It is to mention that the first action from the village Cozesti, district Singerei for 20 poor, old, lonely, ill people is already functioning very well for one year. With great joy, we would like to announce that our annual Report of Activity 2017 is now available on our website under the Reports section. 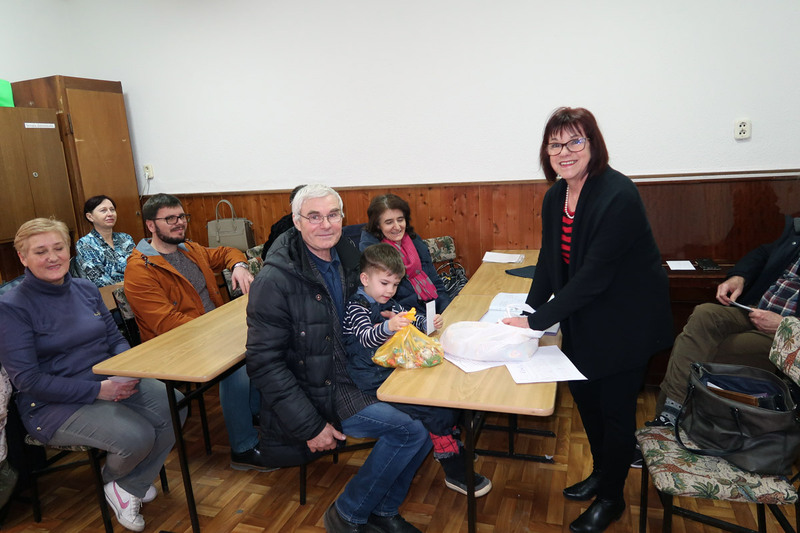 During a meeting with all coordinators and educators of the day care centers BUNVOLENTIA, Mrs. Maria Balan, the school director from Cozesti, said that she cannot imagine, how the children from Cozesti would live without the day care centers BUNVOLENTIA. This is more than an opinion of the school director. It is a conviction shared by all educators and coordinators, as well as by 383 children of the day centers. The centers are a blessing for needy, socially vulnerable children, who often remain without parental care and safety, attention and support. They give such children a hope in difficult times, that there is a future for them too. In addition to a full healthy nourishment, they also develop their talents in various areas (sewing, carpentry, handwork with natural material, thread, paper, glass beads, etc.). A new year comes with new blessing and with first visitors from Todtnau. 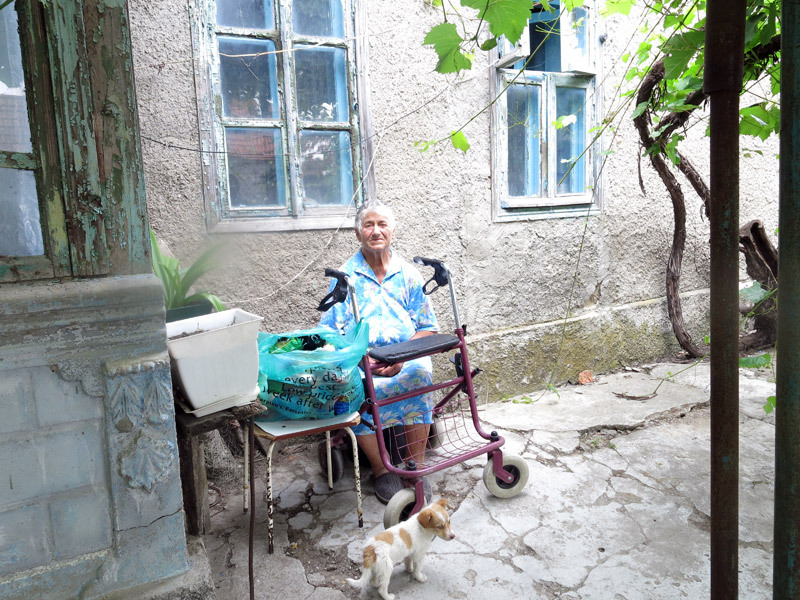 Mrs. Ursula Honeck, President of “Hilfe für Osteuropa e.V.” is working in Moldova for 23 years. In her first visit from this year, she was accompanied by her husband, Dr. Thomas Honeck. 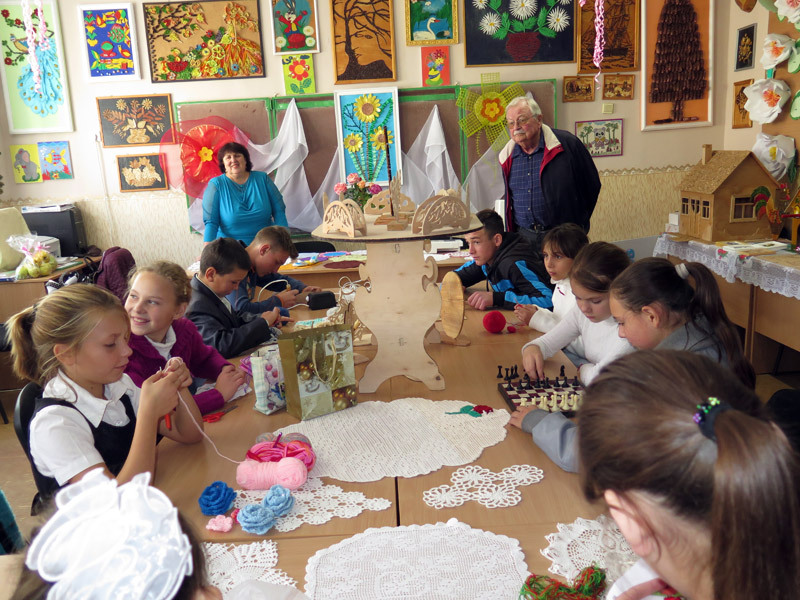 They visited the projects of the organization from Orhei and Edinet. 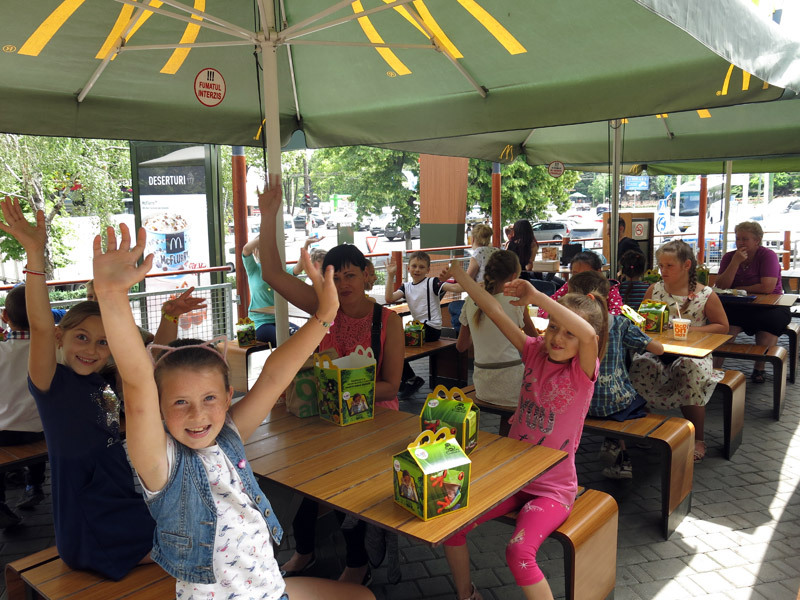 In Chisinau took place a cordial meeting with all sponsored families as always. The sponsored families received Mrs. and Mr. Honeck with great joy. Many words of thanks and blessings were spoken. At the same time, they met a young man who suffered from leukemia as a child. 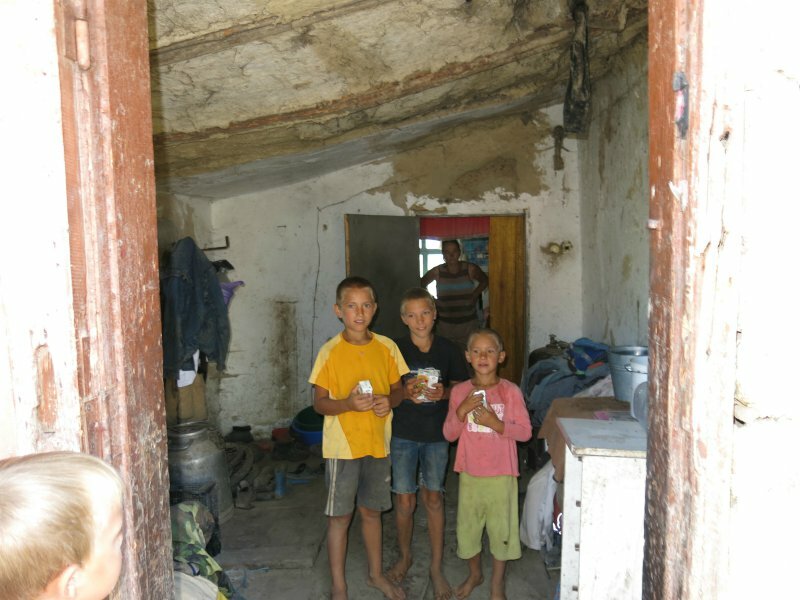 Back then, Mrs. Honeck supported this family, so that the boy could have a normal healthy life.